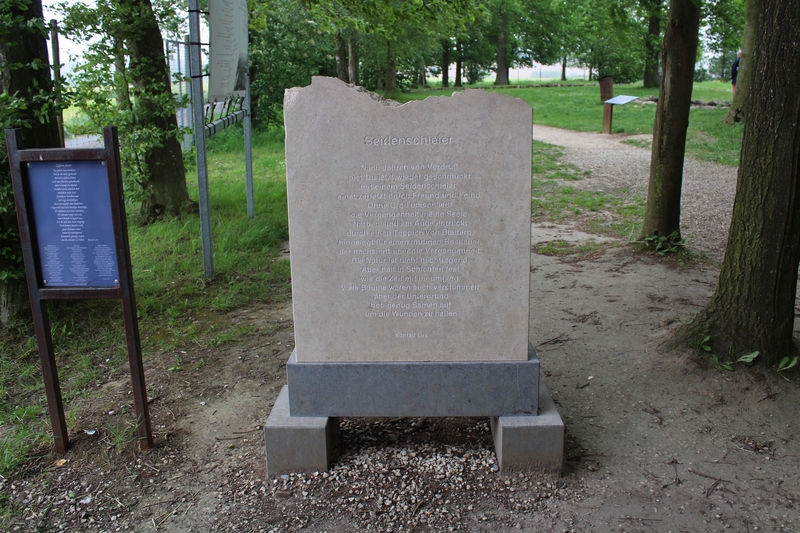 In the fields just over three miles south, and a little west, of the Lille Gate in Ypres (Ieper), there’s a little cemetery called Croonaert Chapel Cemetery, named after a shrine that once stood on the road between Wytschaete and Voormezeele. 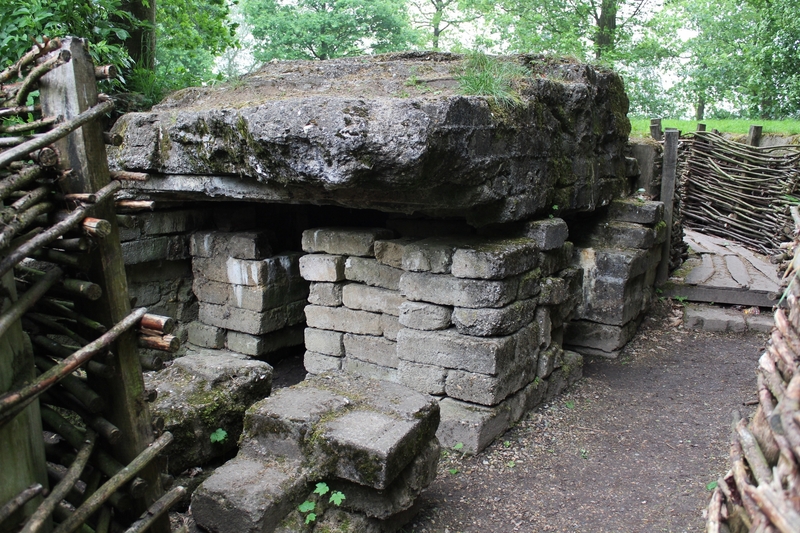 We have never visited it, and we ain’t gonna do so today either, I’m sorry to say. 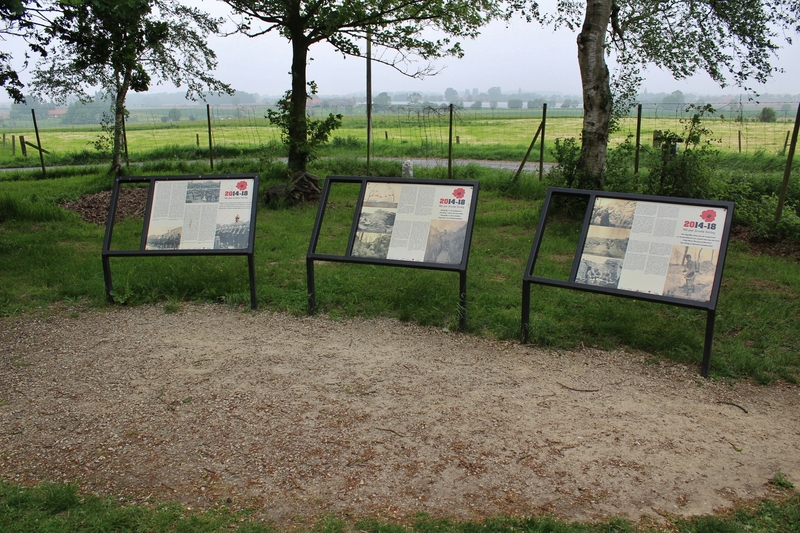 We are here for different reasons, but before I explain, bearing in mind that we are currently standing in No Man’s Land as it was before the Battle of Messines, looking towards the British lines, you might like to know that the farm buildings on the horizon on the far left are those of Hollandscheschuur Farm, where three mine craters still exist from the opening day of the battle. One day I shall see if I can get permission to photograph them. 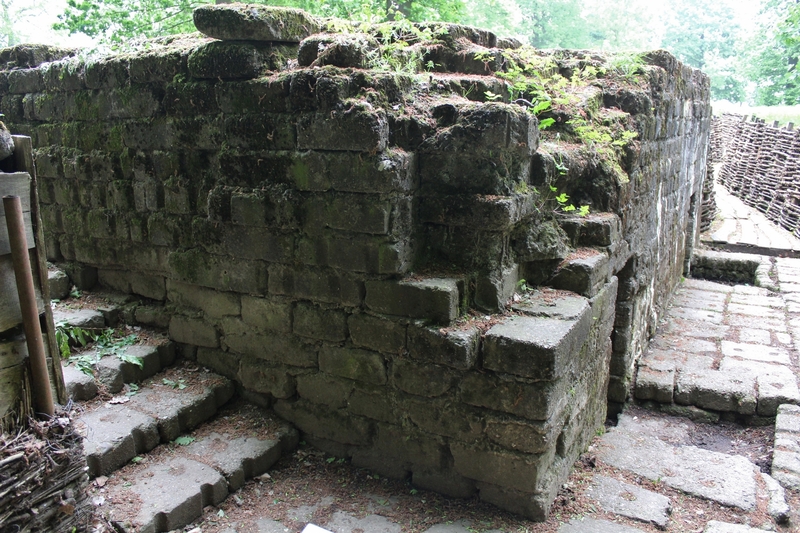 …some way this side of where the cemetery now stands. 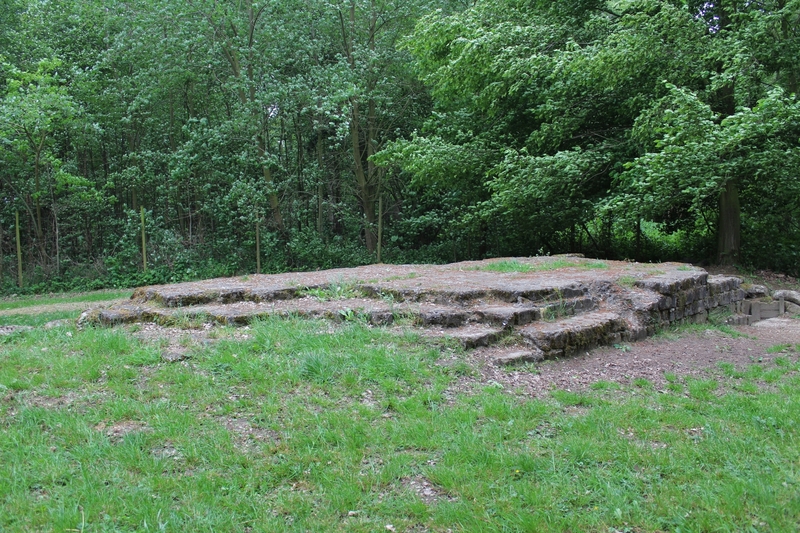 …this one showing the view looking north. 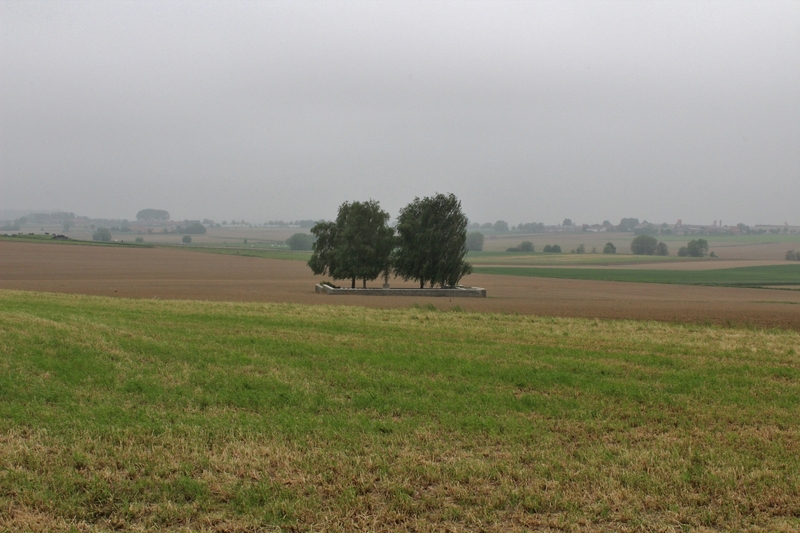 Zoom in and you can not only see Ypres through the mist in the centre, but also the piece of shrapnel someone has kindly left on top of the panorama – and no, I left it there for somebody else. 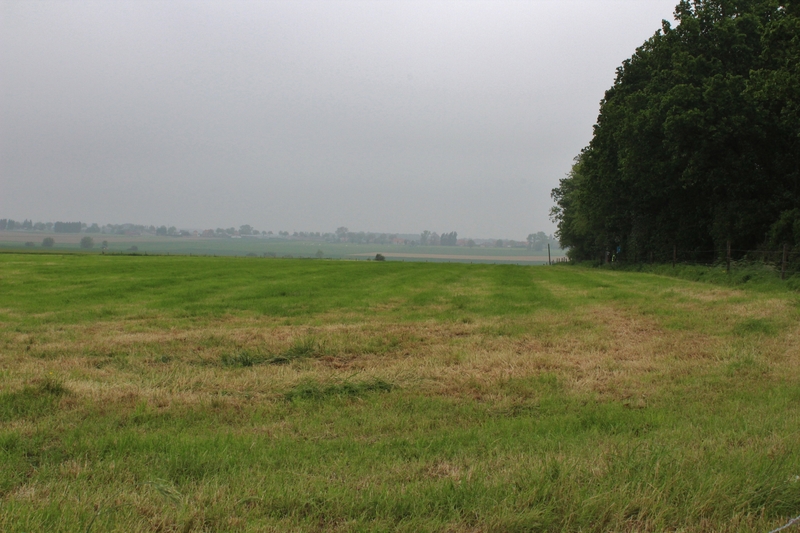 The French, who originally held the trenches (the crenellated line in the top left) in the fields facing this wood, called it the Bois Quarante, the British, once they took over, Croonaert Wood, although trench maps would continue to use the French name throughout the war. 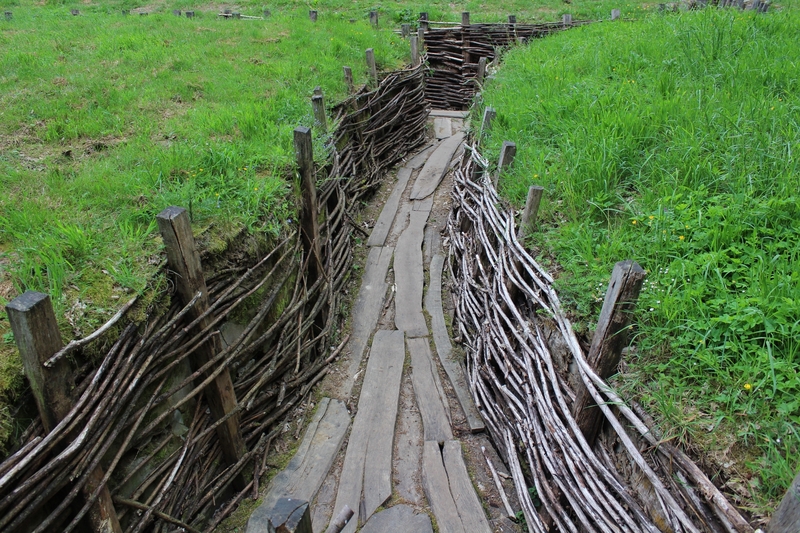 I would assume that (among) the first German occupants were men from Bavaria, hence the name by which the Germans knew the wood, and the name it is still referred to, that of Bayernwald – Bavarian Wood. 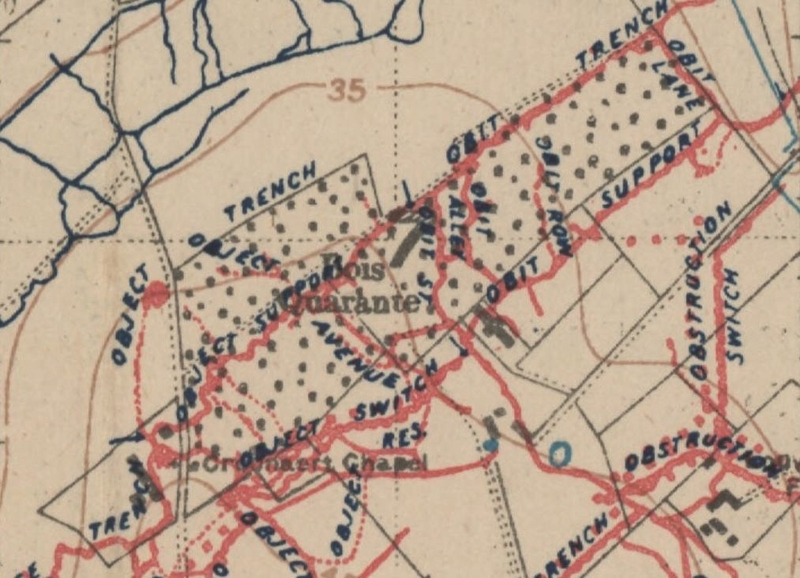 This nice, clear, extract from a 1917 map shows the Bois Quarante as it was during the war, and the German trenches that ran through it, with our current position marked by the orange dot. 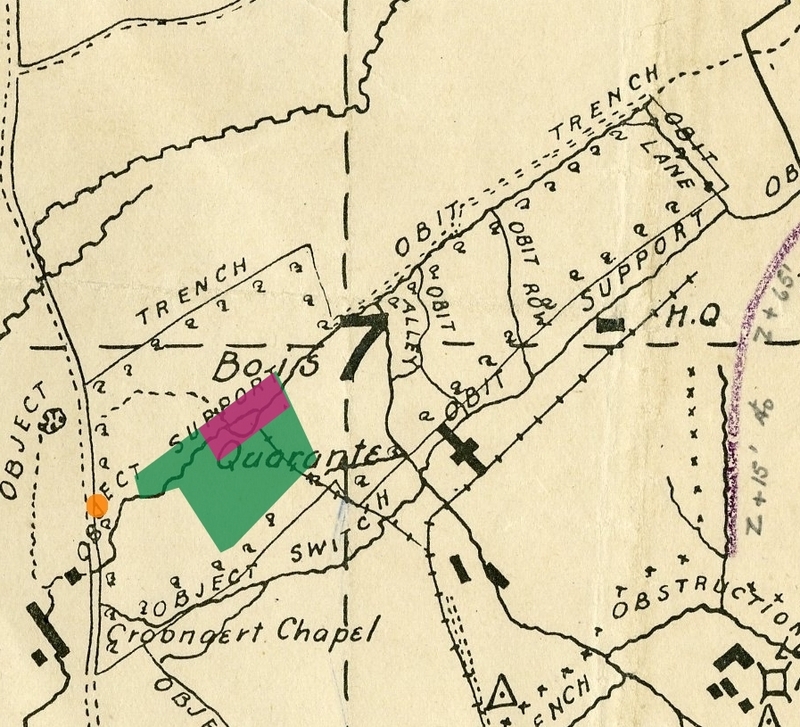 The wood today, marked in green, is nothing like the size it was before war came, and within it is the renovated trench system that we have come to see, marked in magenta. Before we continue, let’s take a look at exactly where we are. 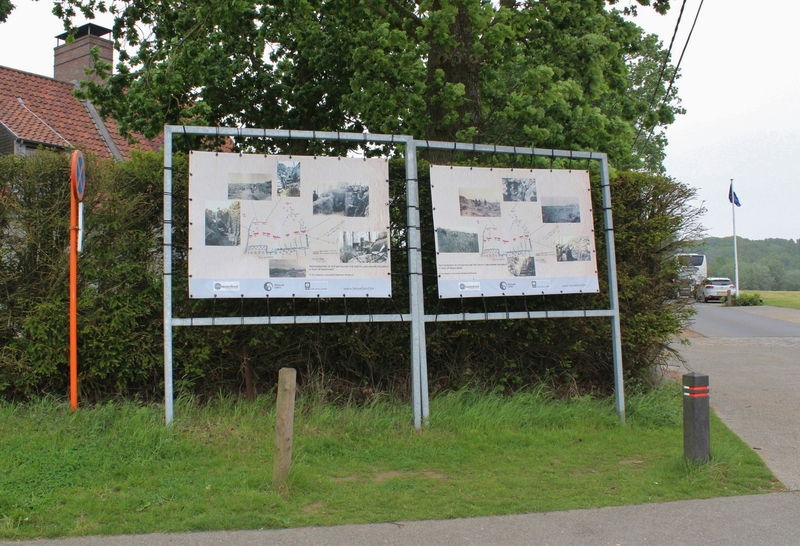 St. Eloi, top right, is a little over two miles south of the Lille Gate, the southern entrance to Ypres. 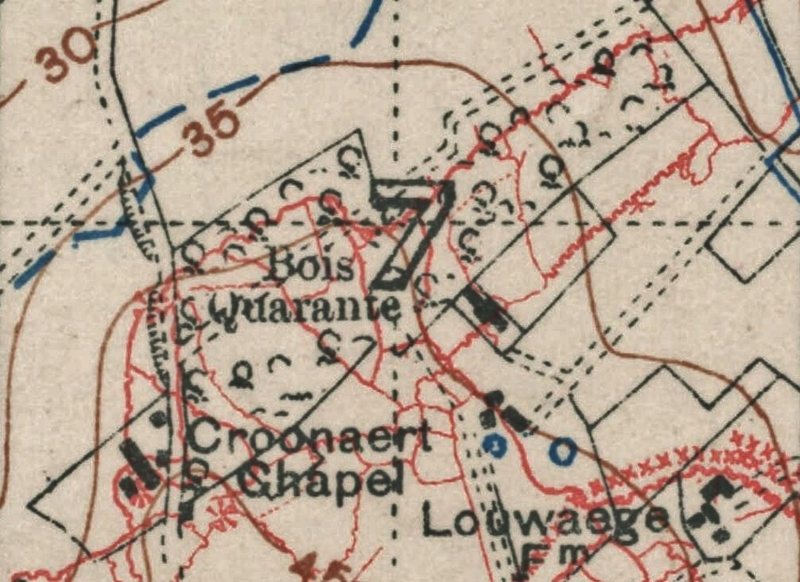 Wytschaete, a mile and three quarters further south at the bottom of the map, sits at the northern tip of the Messines Ridge, with the Bois Quarante roughly mid-way between them, the blue dotted line marking the position of the British front line, the German trenches marked in red. 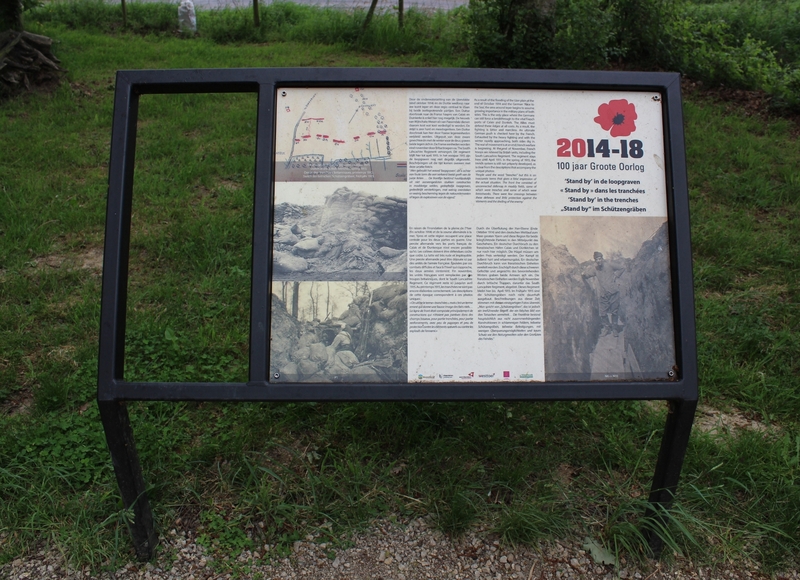 …the current side road marked as just a path beneath the words ‘Bois Quarante’, the wood extending further into the field in front of us in 1916 than it does today. 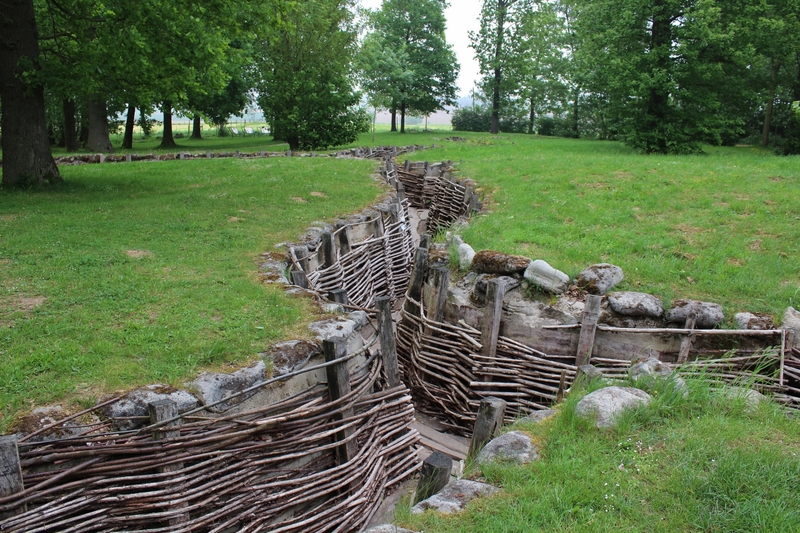 What you don’t want to do, should you ever visit, is just rock up and expect an interesting hour or so in the trenches. 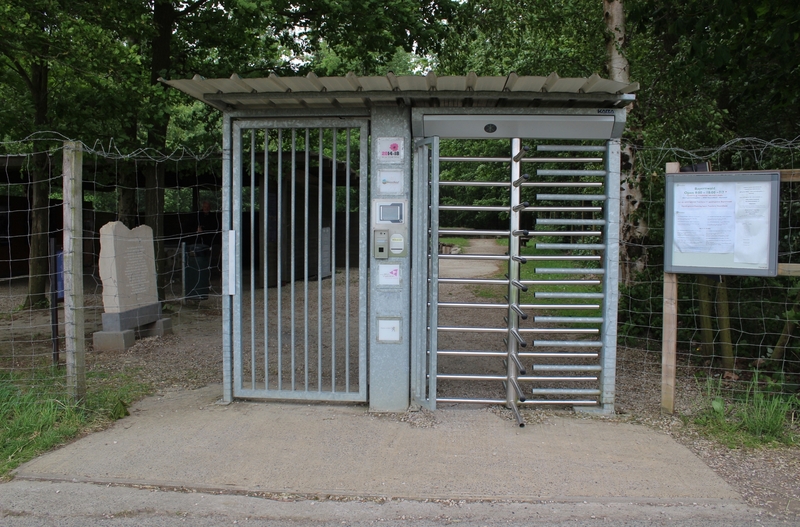 You need to get a ticket in advance, because you can’t get through this entrance without one (at the time of writing tickets are available for individuals at the tourist offices in Kemmel, Ieper & Zonnebeke). 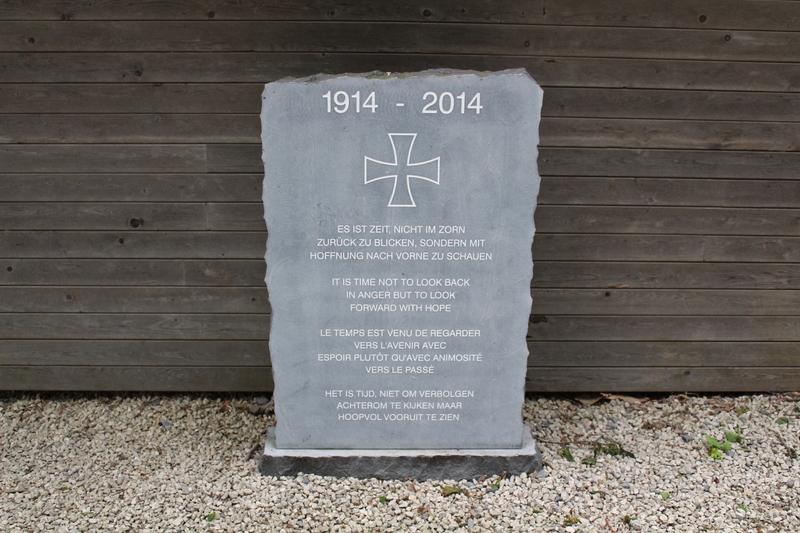 …memorial tablets, this one a new addition for the Great War centenary. 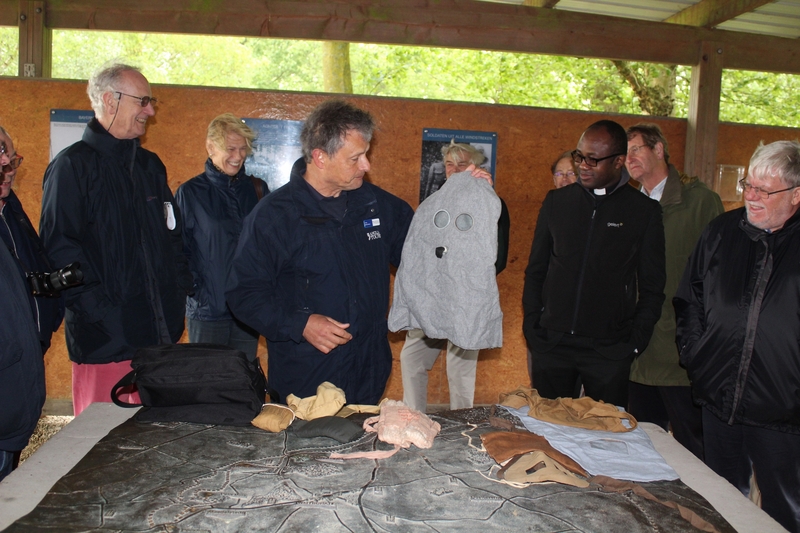 Seriously fascinating talk on gas masks by Major Tim Saunders, our tour guide – I cannot tell you how many examples we were treated to, but at least half a dozen are visible in this photo, and we had only got to 1916 at this point! 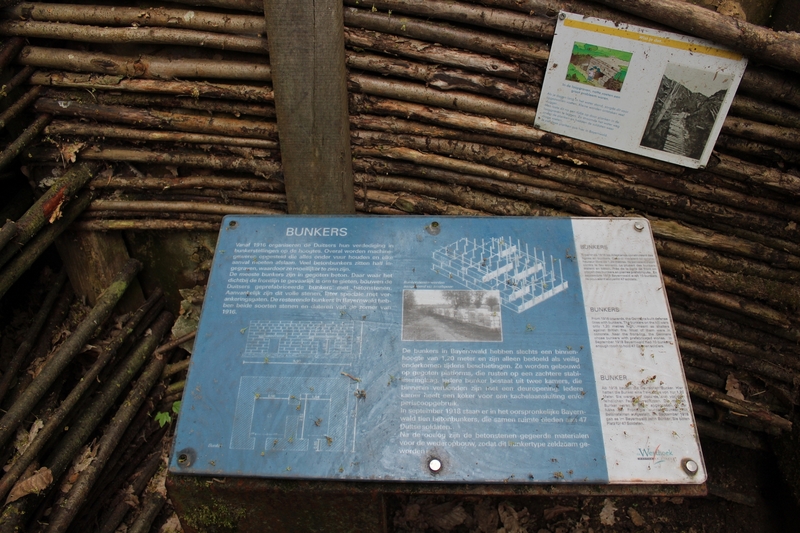 There are various information boards around the site – of course there are. 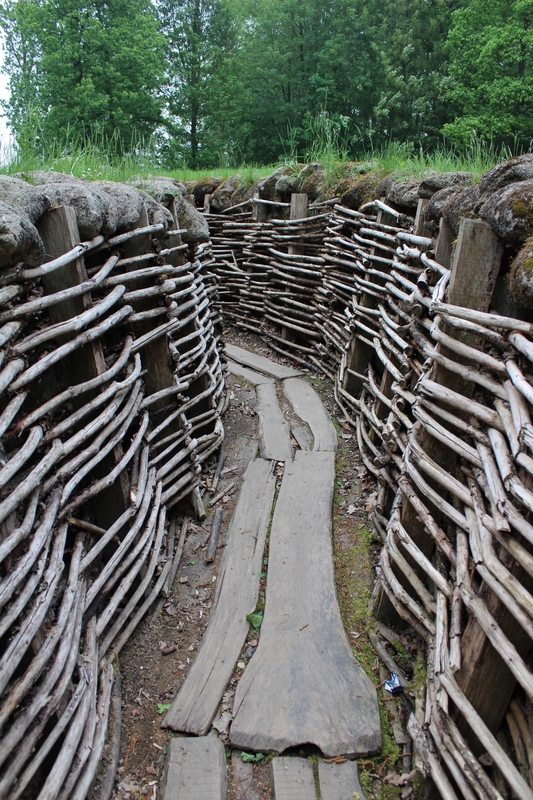 So here we are looking at the restored Bayernwald trenches, the wickerwork quite clearly showing them to be German. 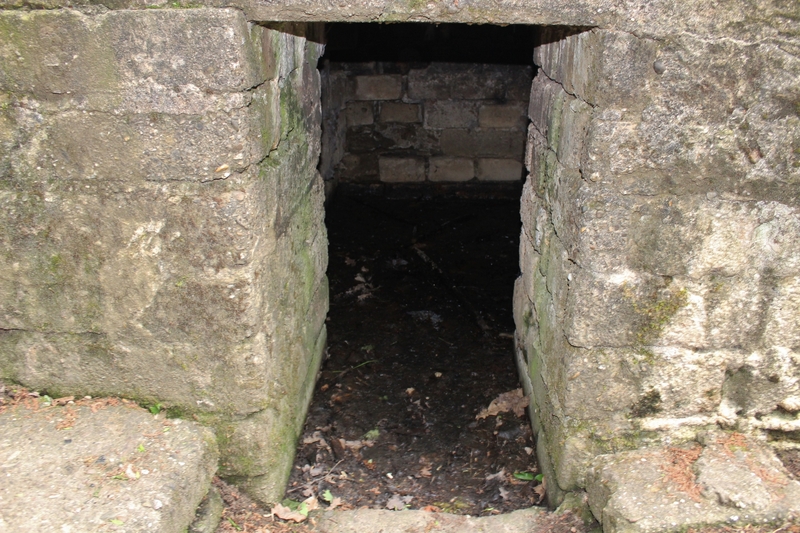 …both 130 feet deep, the tunnels they lead to over 300 yards in length. 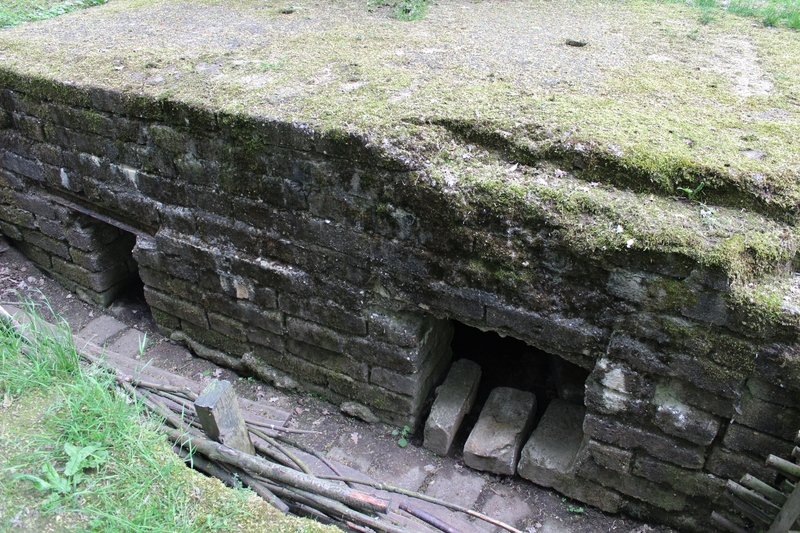 Time to head down below ground. 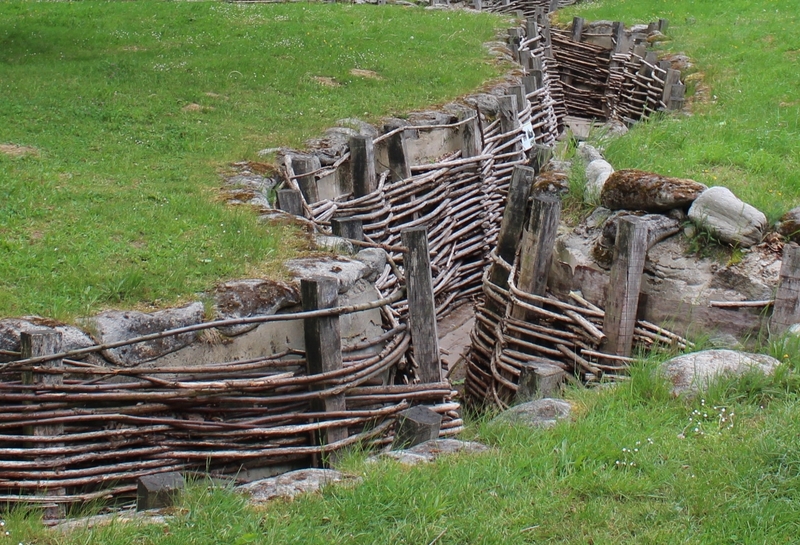 These trenches are quite clearly restored, and it is difficult to establish their exact post-war history. 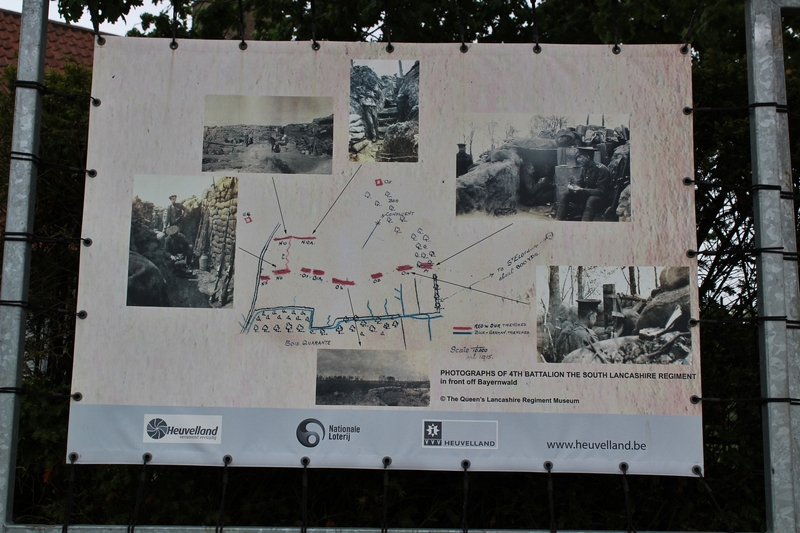 What we do know is that the original trenches here formed part of the German front line from October 1914 right through to the opening day of the Battle of Messines in June 1917. 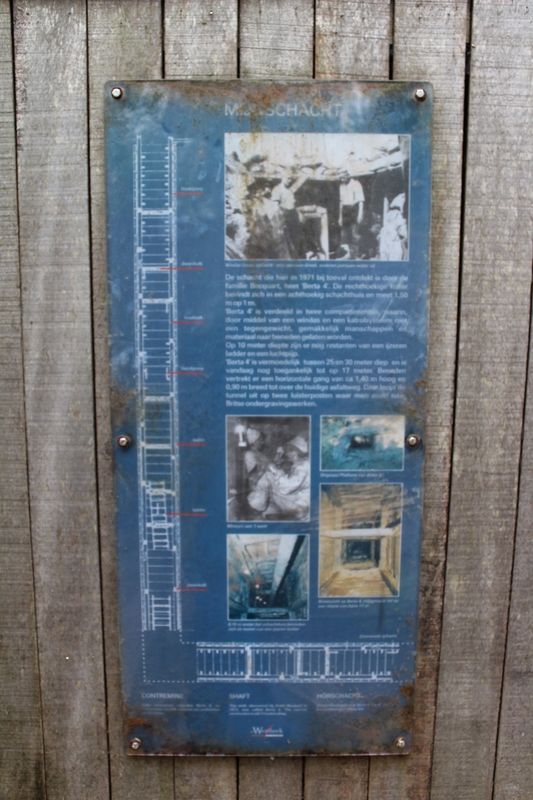 …the British lines in the top left marked in blue and in a little more detail than previously. 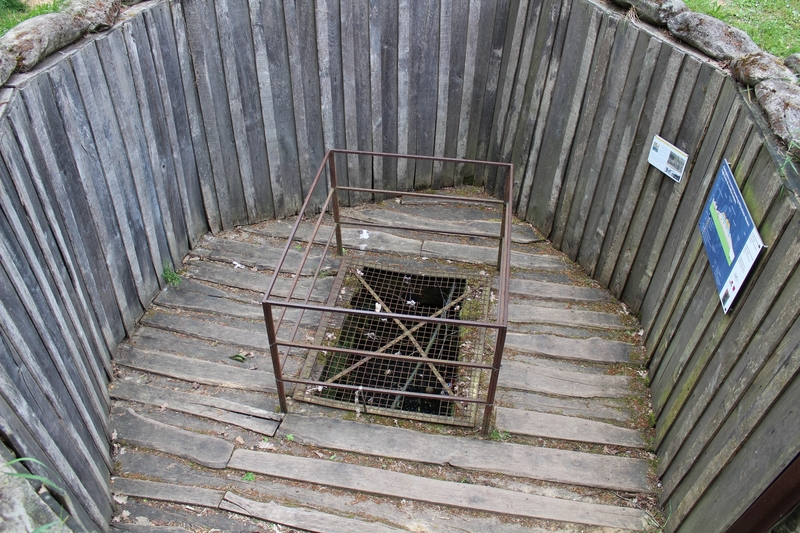 For many years after the war there was a museum here, run by the landowner André Becquart, and the trenches were open to the public who could, should they choose, take a trip down one of the mine shafts in a bucket seat! If only! 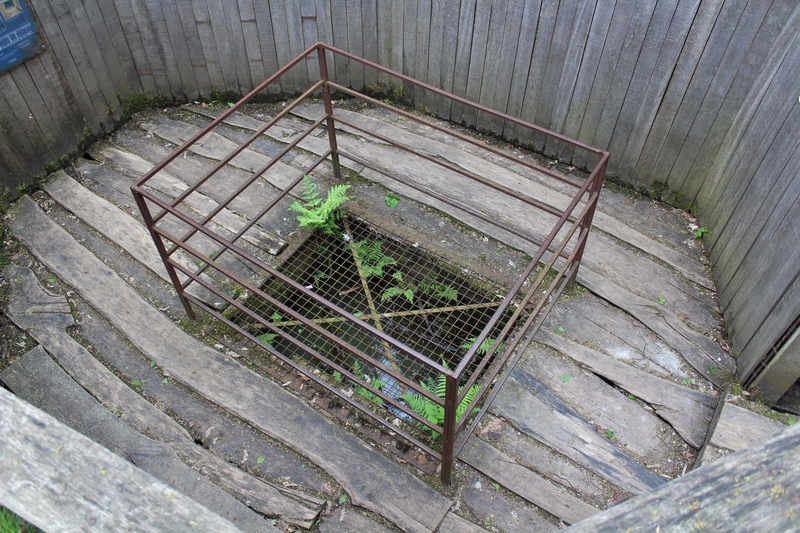 Sod health & safety. 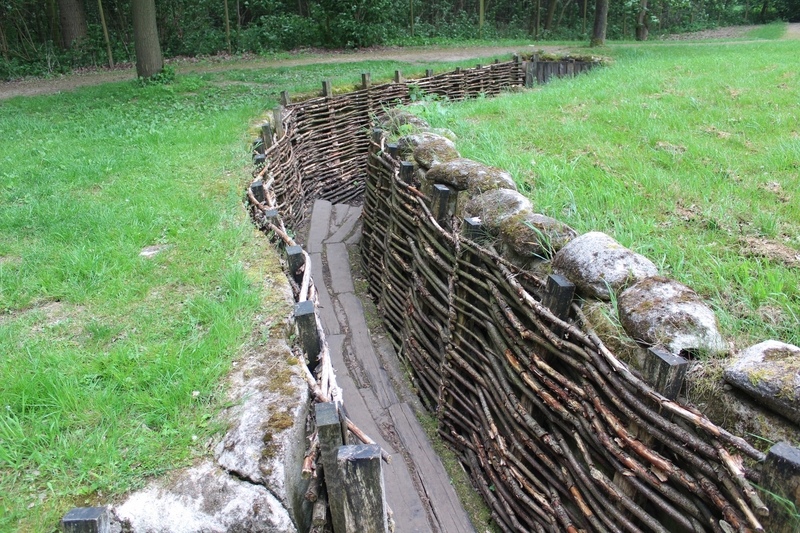 Following his death in the 1980s, the wood and trenches fell into serious disrepair, but no longer, hence our visit. 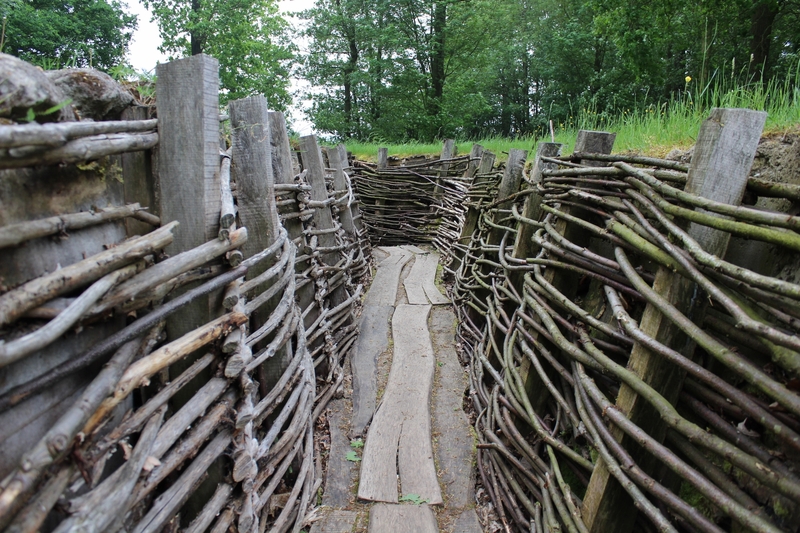 The trenches were meticulously restored, based on a German trench map from 1915, I believe, some time in the late 1990s or early 2000s, and re-opened to the public in 2004. 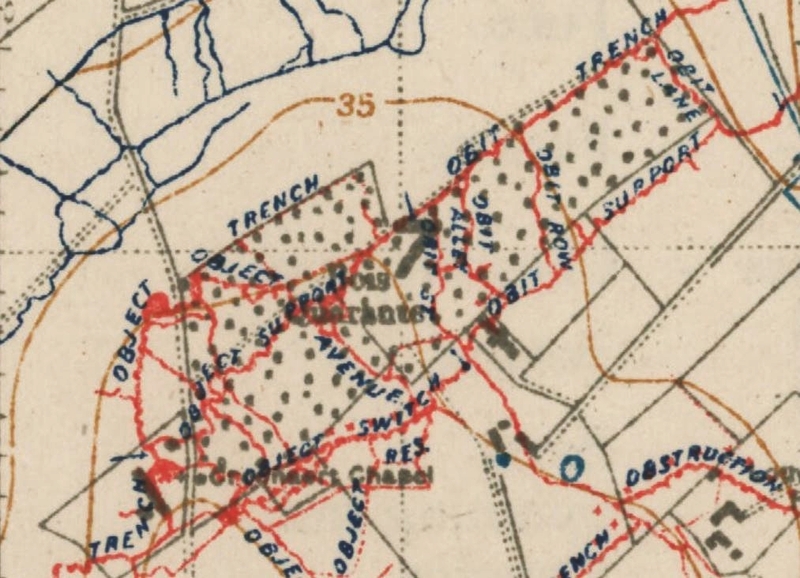 …and this map shows how little had changed by April 1917. …and, just to show how much the quality of printing could differ from one print run to another, this is a different copy of the same map with more ink! 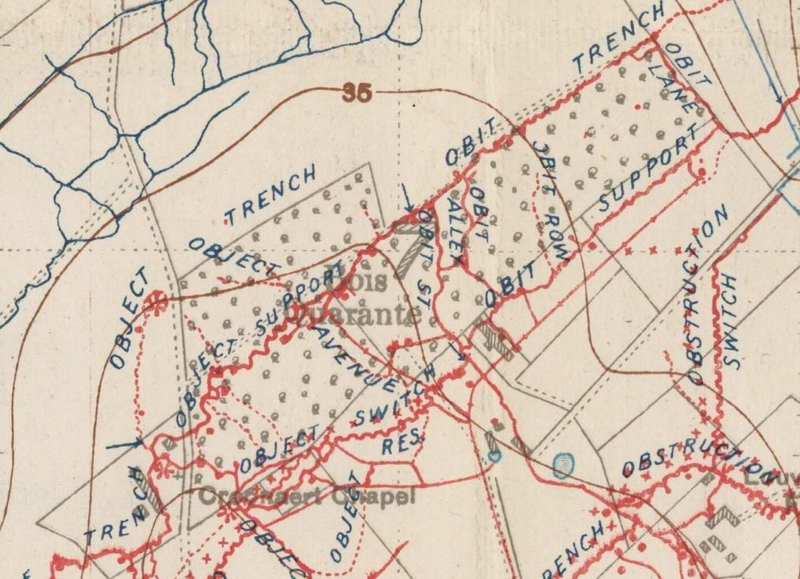 Note that we are in the ‘O’ zone here (forgive me) with regard to trench names. 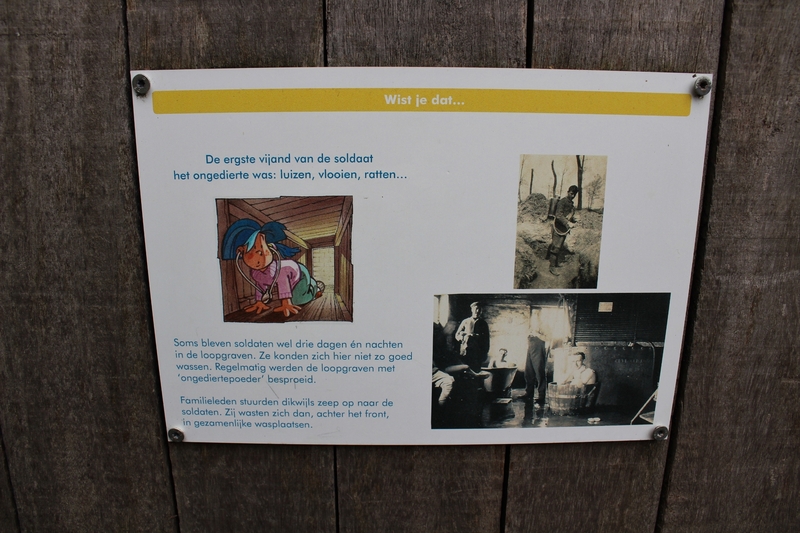 …where we find more new information boards (close-ups below). 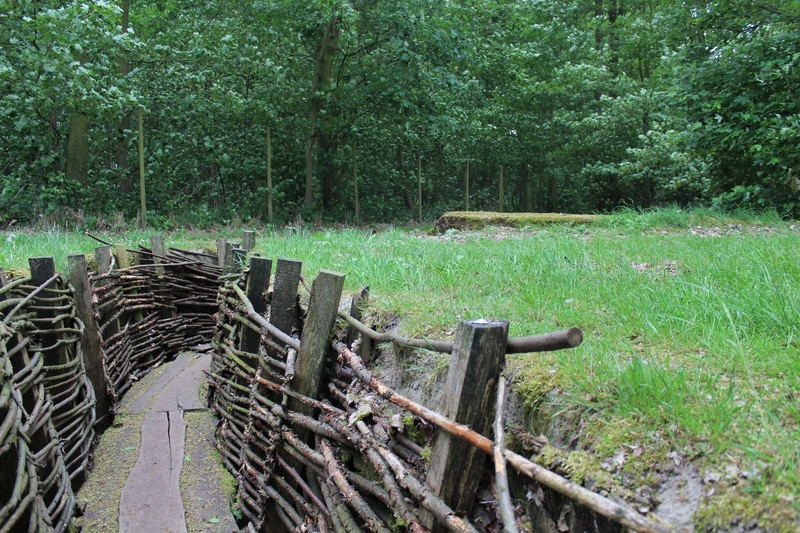 This picture also gives a good idea of the German view over the British lines beyond the wood. 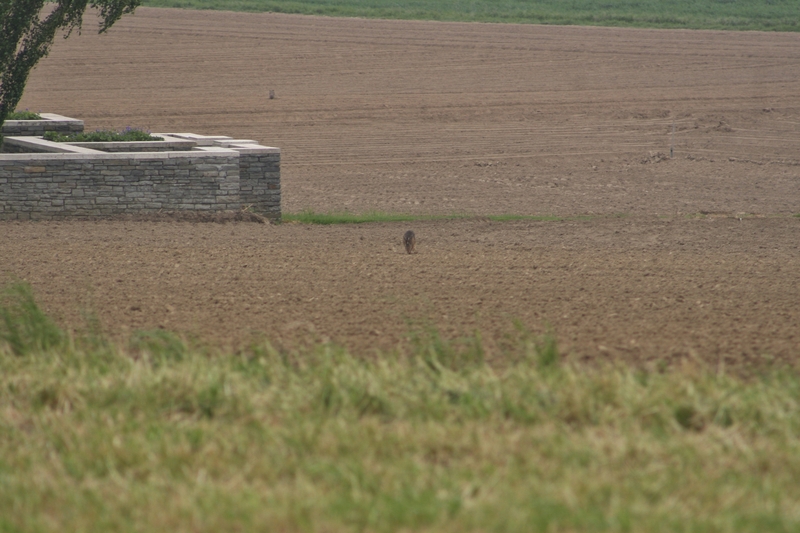 …although to be fair I could have just zoomed in closer from above, couldn’t I? Not much chance of a bucket seat today. 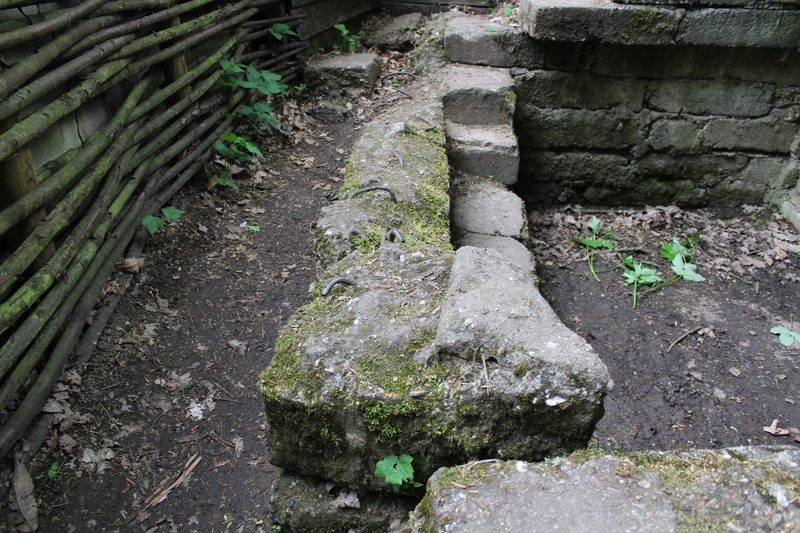 This particular shaft was known as Berta 4. 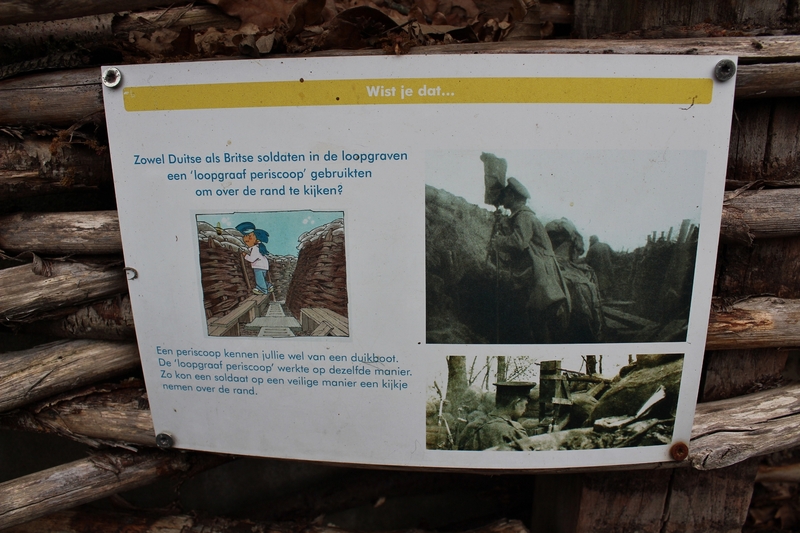 Old signage (above), and new signage (below). Who said anything about dumbing down? 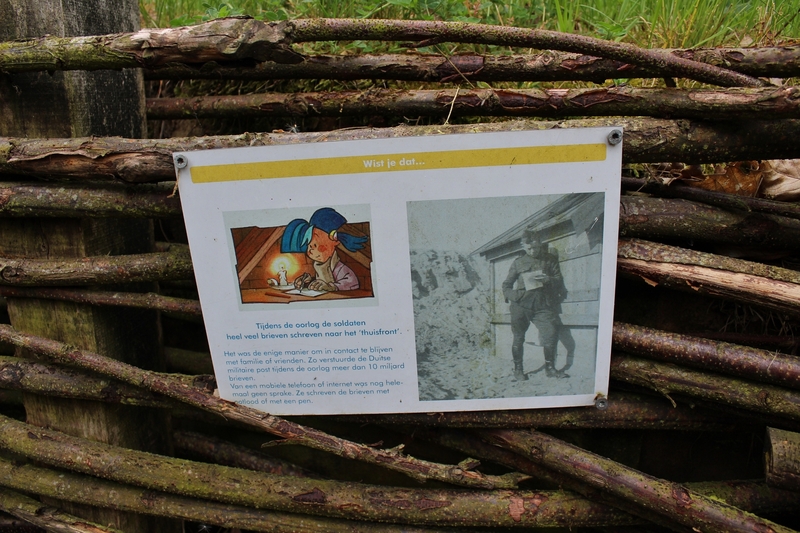 …nor much head height, either. 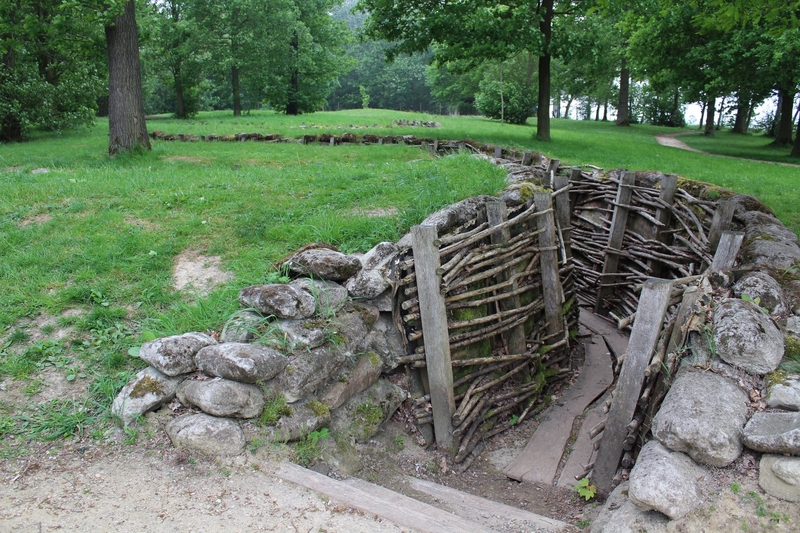 This bunker was designed to protect the troops manning these front line trenches, not provide comfort for them. 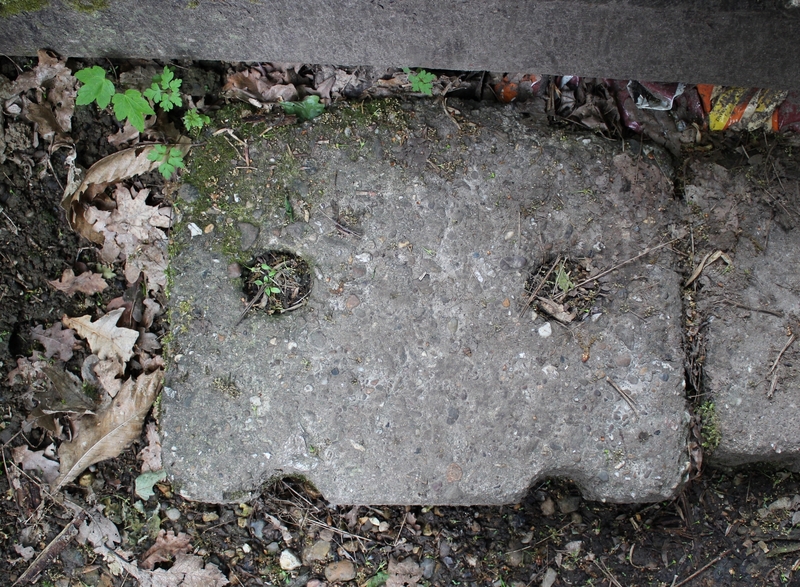 …onto which pre-fabricated concrete blocks, such as this one now lining the trench floor, could be slotted, using the ready-made holes already drilled through them. 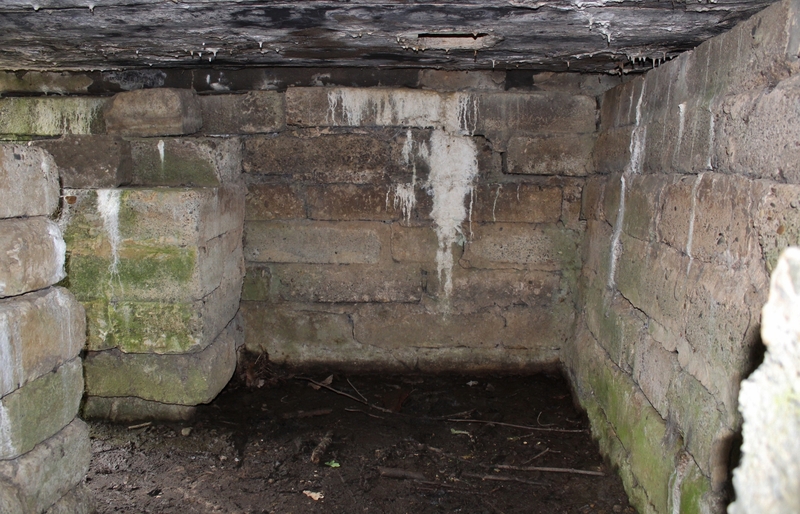 …this end room lacking its roof, the doorway an interior one between two rooms within the bunker. 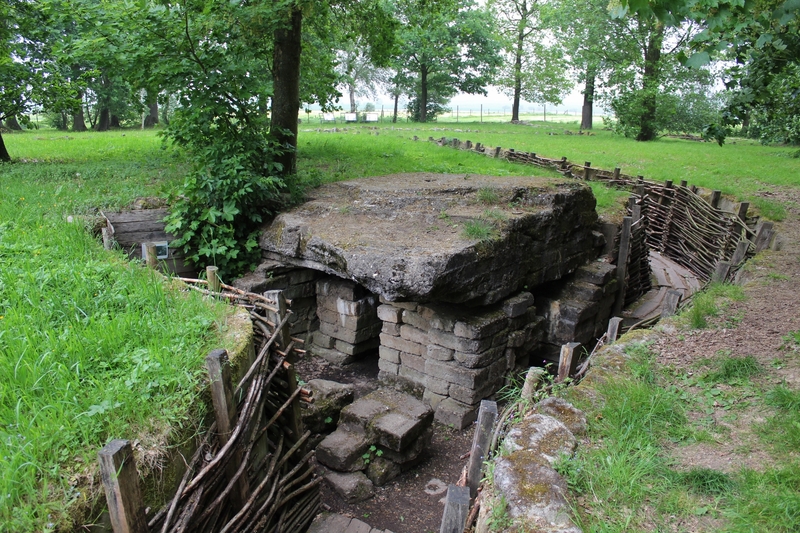 …back above ground once more, this is the first bunker again, the short trench we walked down to reach it joining one of the front line trenches in the background. 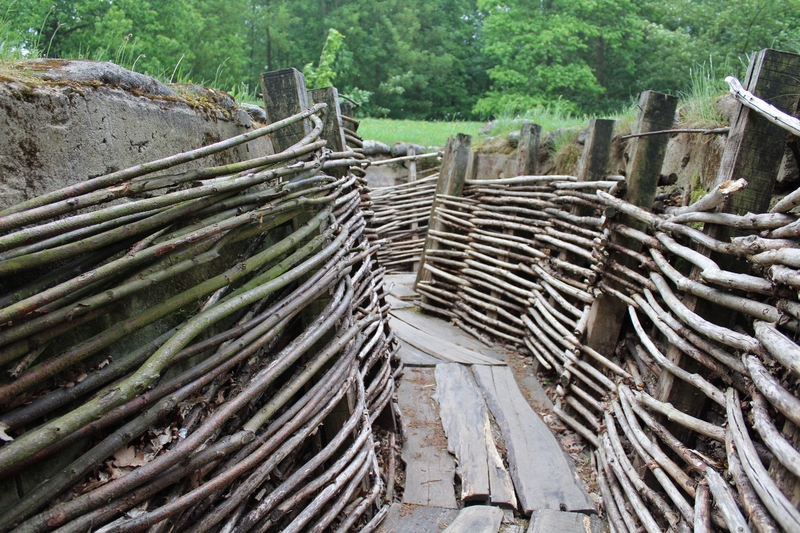 With British artillery blasting the front line trenches fifty yards away, the German troops defending this sector could hopefully huddle within these bunkers, far enough away to be safe from anything other than a direct hit, and close enough to the front line to be back in position by the time any attacking British troops could cross No Man’s Land. 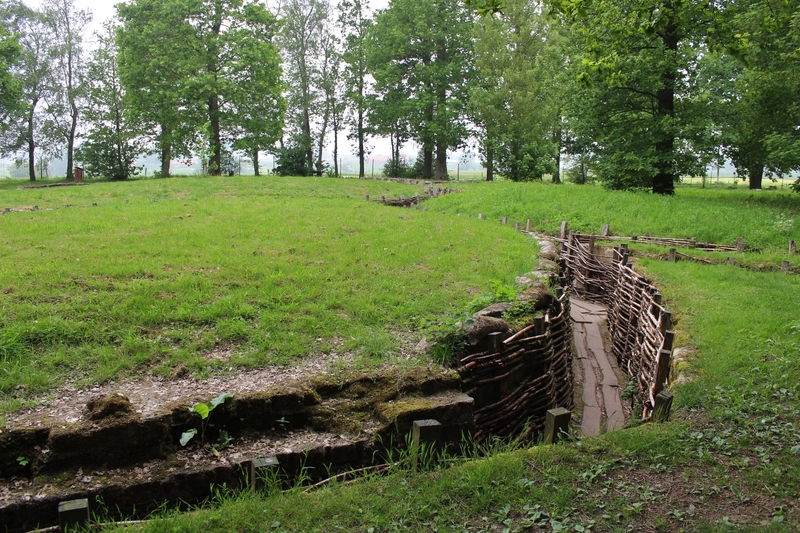 I would guess that this particular trench was either once a communication trench that went further into the trees beyond before the site was restored – or maybe it was just a latrine. 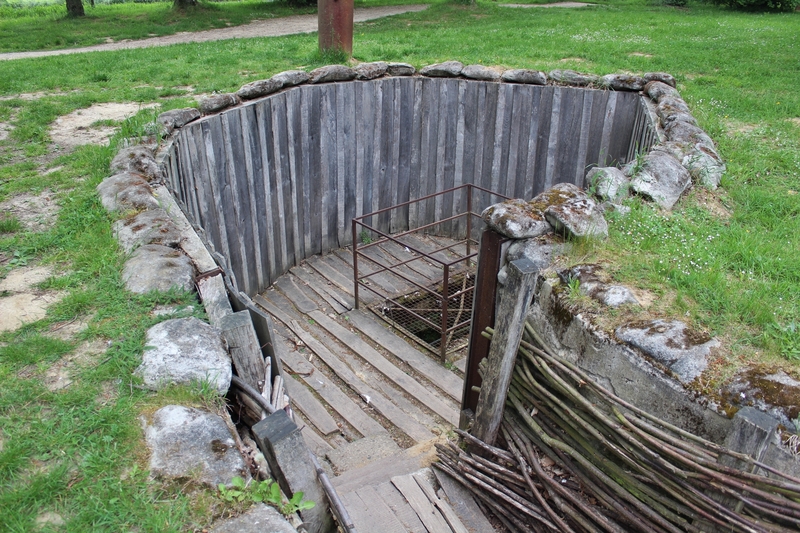 By July 1917, in the aftermath of the Battle of Messines and prior to the beginning of Third Ypres at the end of the month, the eradication of the German salient had moved the front lines some three miles to the east. 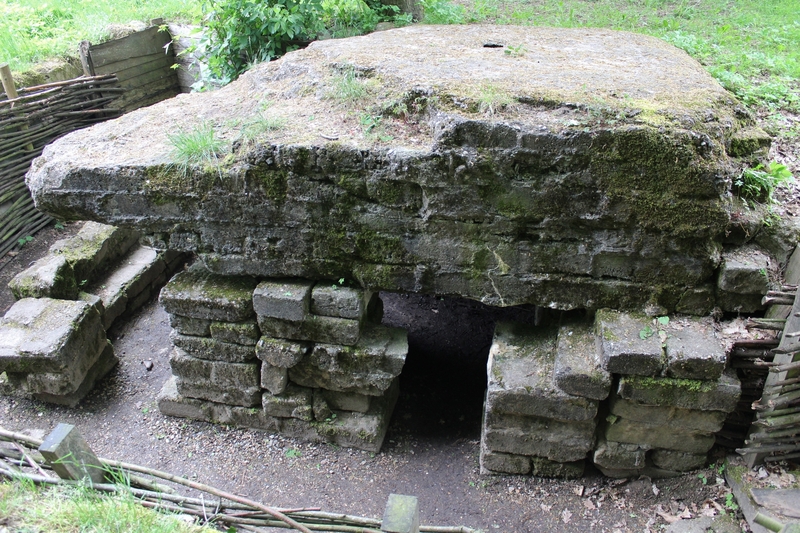 …we once again encounter the second bunker, and from above ground you can see why I think it doesn’t look right. 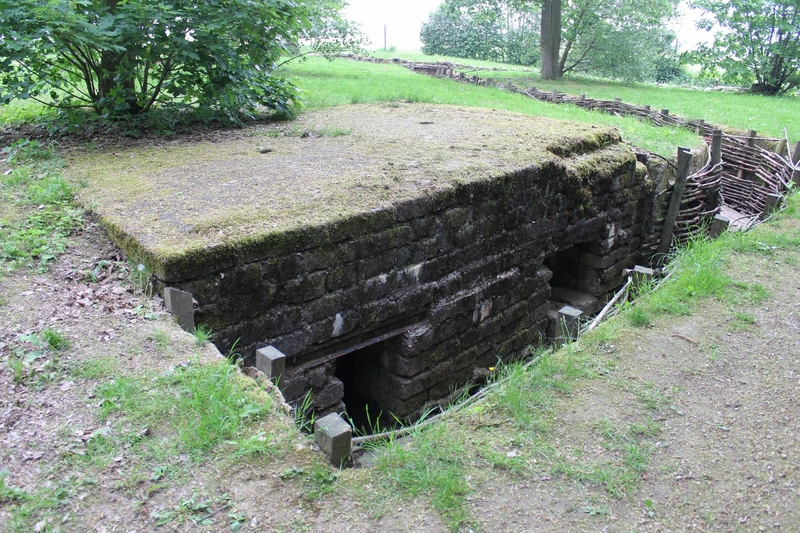 The bricks supporting the roof are haphazardly positioned, with no mortar, and as we have seen many times before, the Germans simply didn’t make rubbish bunkers like this. 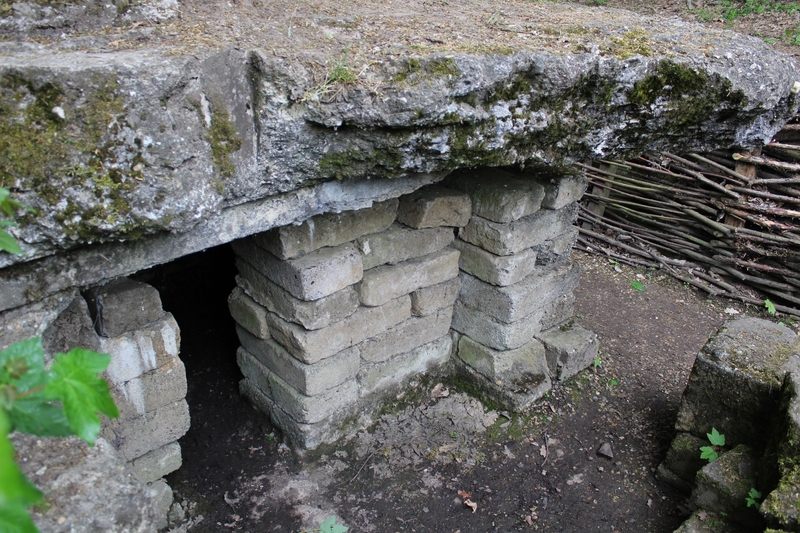 I think that this is an amalgamation of two bunkers, the blocks of the bunker walls moved at some point from somewhere else on site and placed on the foundations of a bunker that was already here, with the remains of the original roof then placed on top. 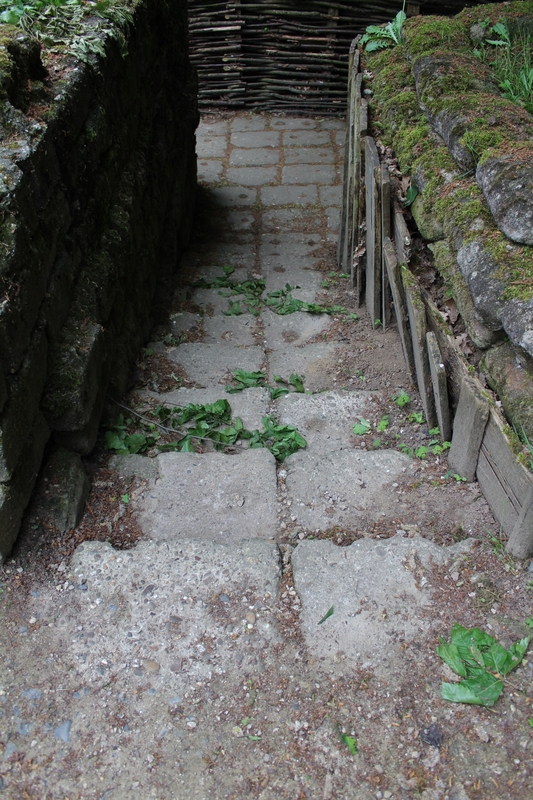 …the steps leading down again made of pre-fabricated concrete blocks as we saw earlier. 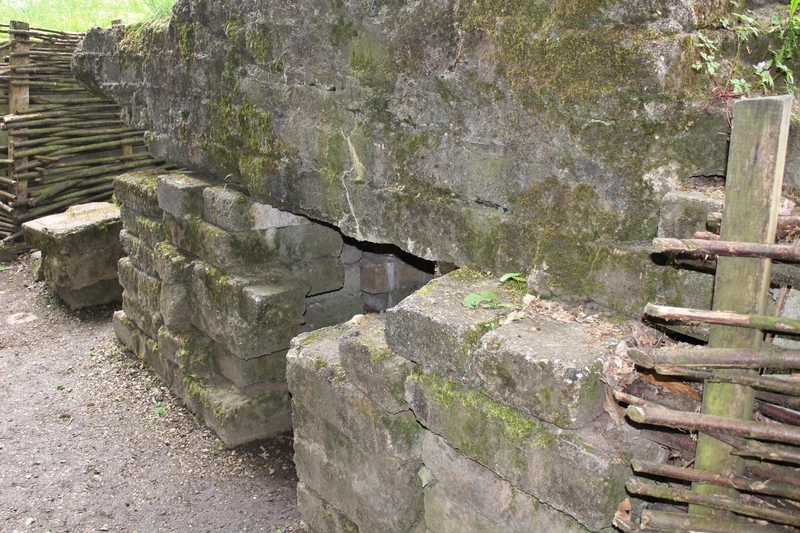 Serious signs of external damage, possibly by scavengers, military or civilian. 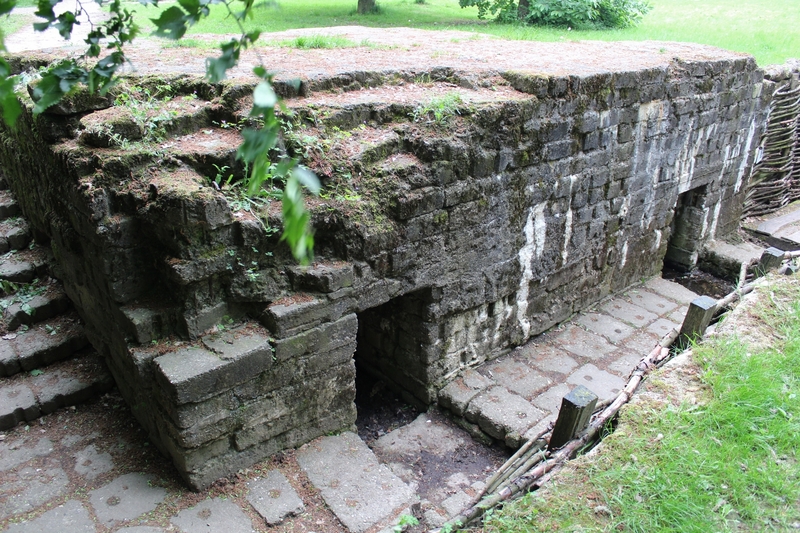 From above you can see that this bunker again has two entrances and is quite a bit bigger than the other two. 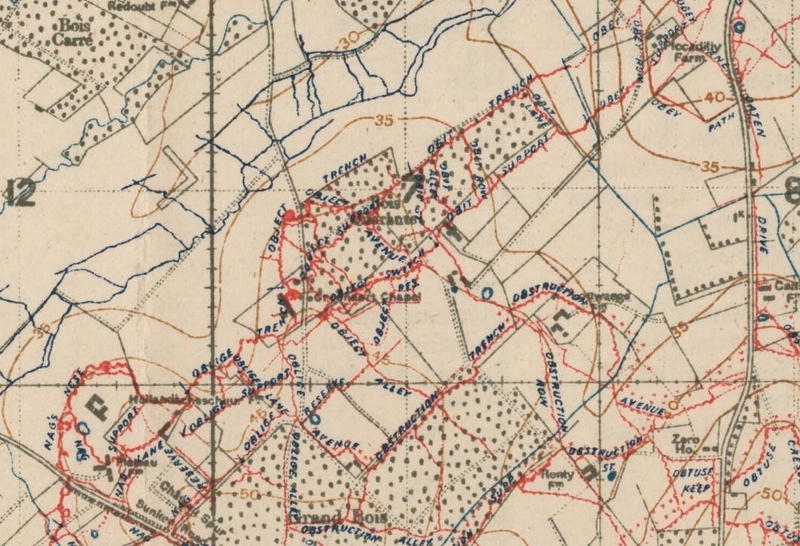 By the spring and early summer (maps between May & July are the same) of 1918, the German spring offensive has swept west, and this map, with the German dispositions marked now in blue, shows light railways and the general melee of the rear area. 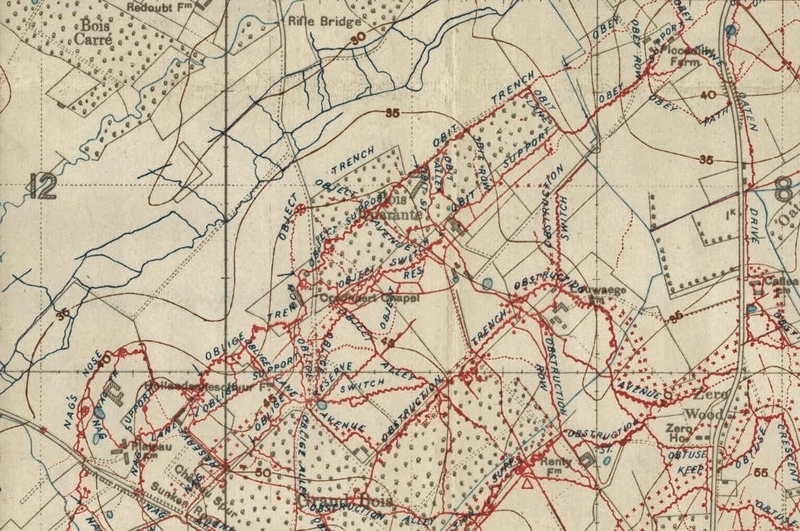 September 1918, and the Allies’ final offensive, now marked in red, approaches the wood from the west (above & below). 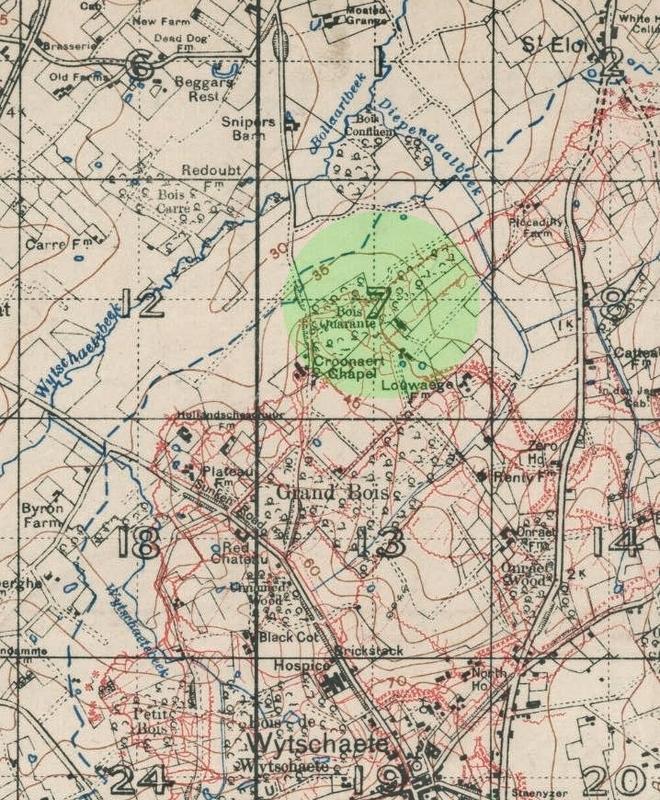 A few trenches are still marked within the wood, and the road immediately to the west, where this post started, is no longer marked – well, it is marked, but now it meanders through the fields to the west of the wood right in the centre of the map, as opposed to following the straight westerly edge of the wood, as it has done on all the other trench maps we have looked at. 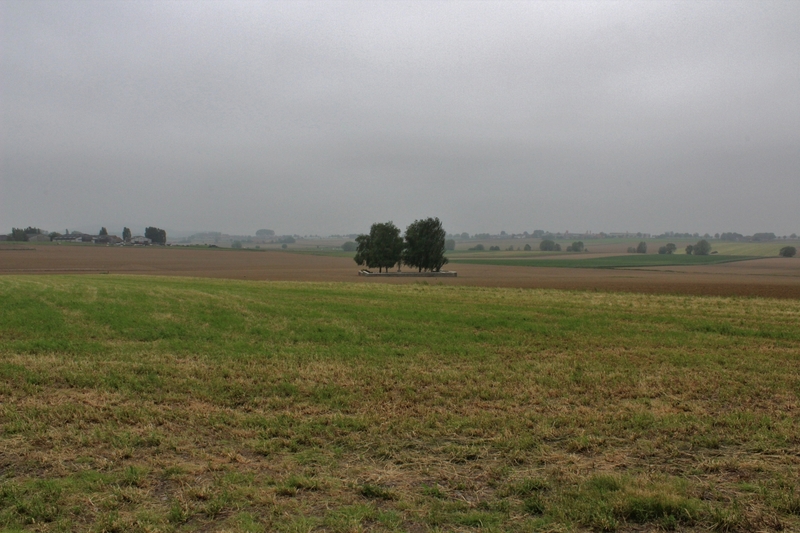 …towards the British lines crossing the field. 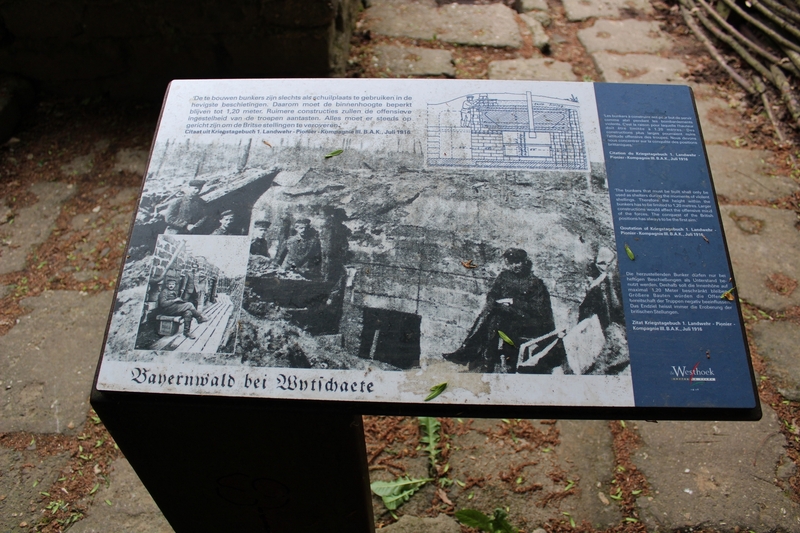 …the locations of the photographs marked on the maps in the centre of each. As ever, click to enlarge. 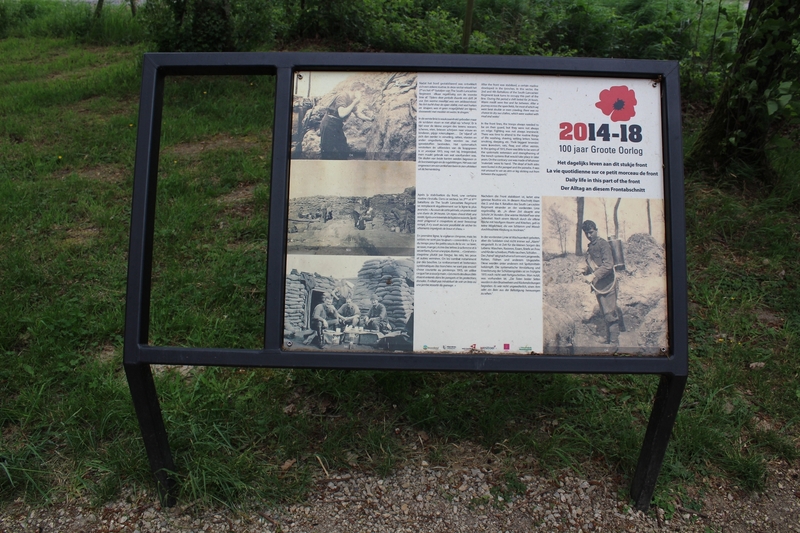 …but in the meantime we shall leave it to its seventy five sleeping soldiers, and the local fauna. 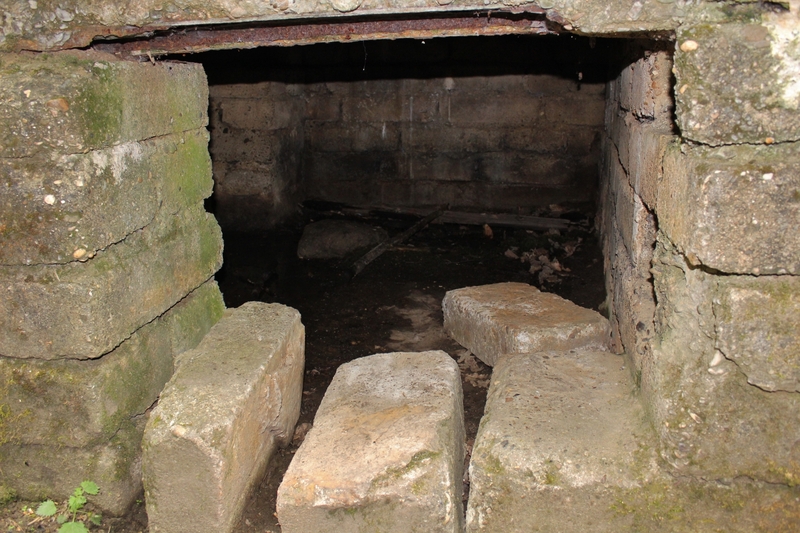 This entry was posted in Bunkers. Bookmark the permalink. A fascinating and informative Post thank you. 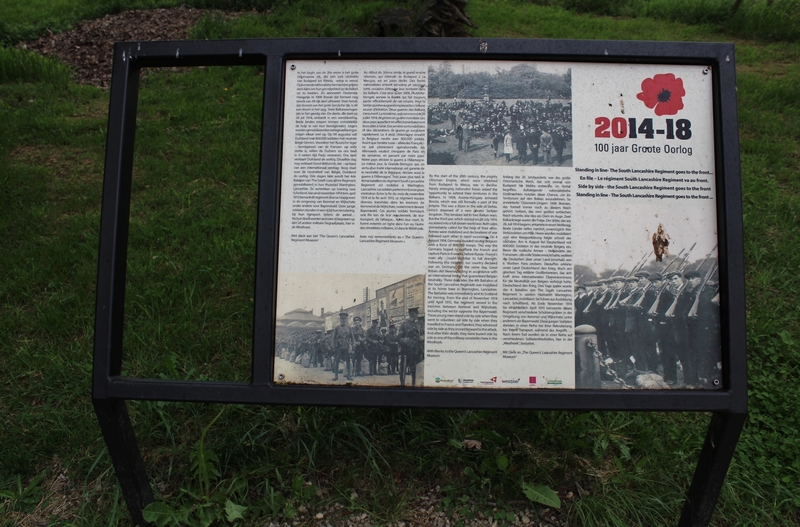 I particularly enjoyed the enlargeable old panoramas. 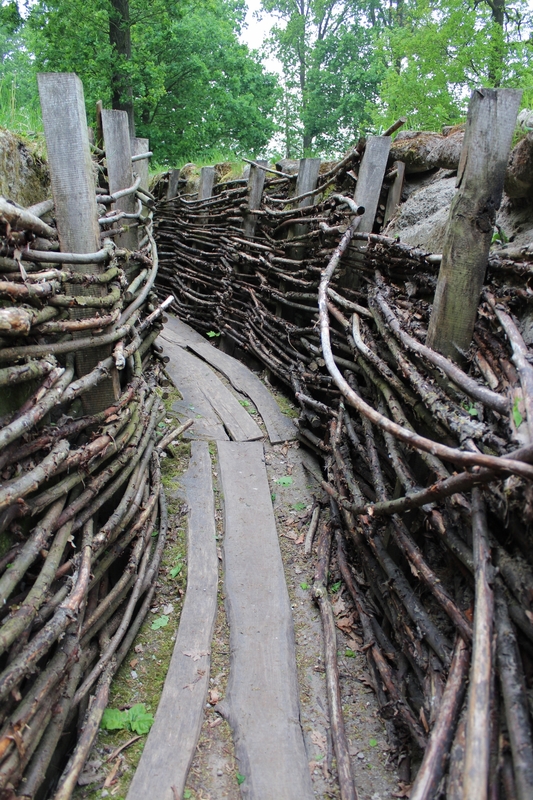 And again the mind boggles at Battlefield infrastructure and planning. Certainly no “comfort stations”! Indeed Sid. Just a RSS problem – caused by me, actually – on this occasion. I’m glad you enjoyed this one. 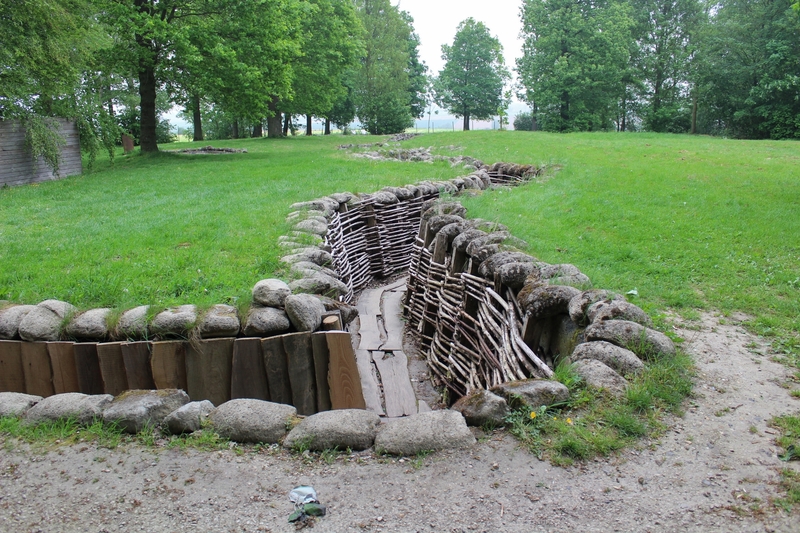 Not too easy to write about photos of trenches, but it all seemed to come together in the end. 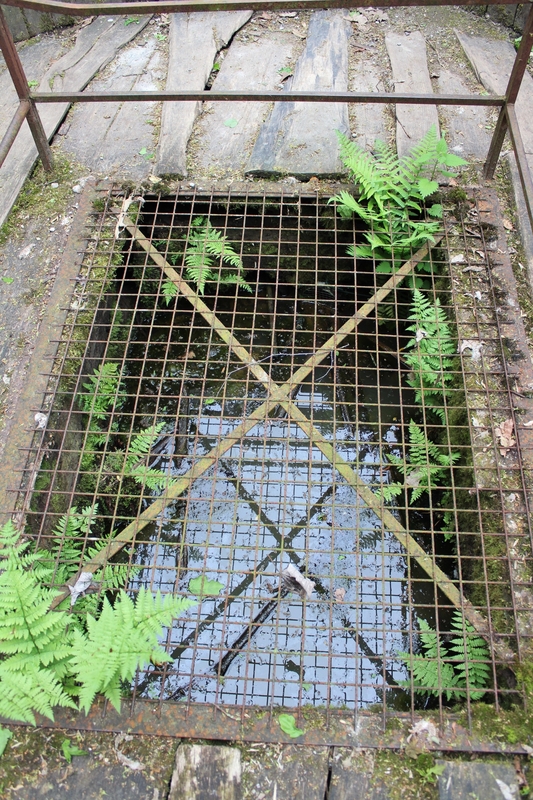 So you wouldn’t fancy joining me in a fougou I know down in Cornwall. 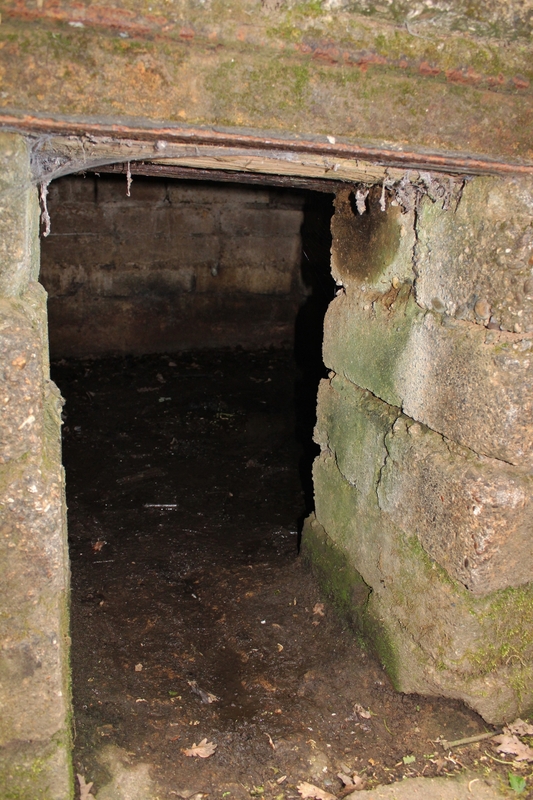 There’s one section near the very end of the tunnel where you have to get on your stomach and crawl through a rather small (about 18 inches by 24 inches at a guess) aperture – and all by torchlight, of course. No? Not for you? Ooh. 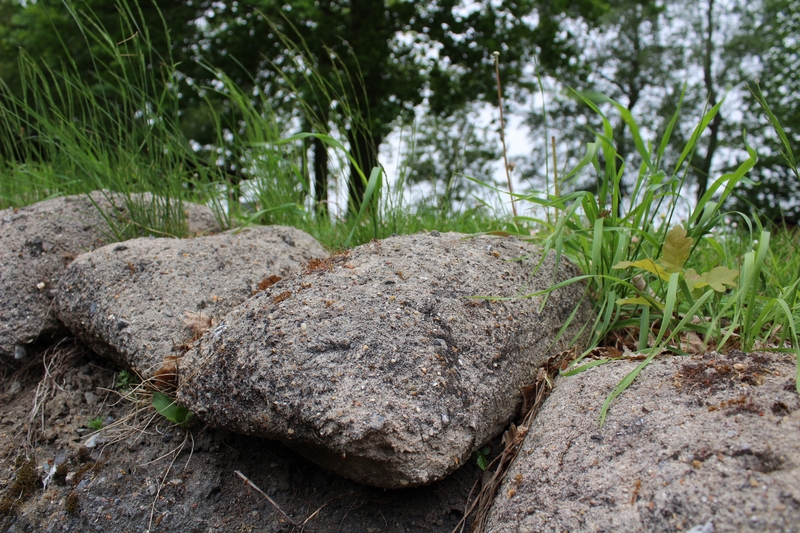 I have seen some earlier photos, but I’d like to see yours if you find them. I have not forgotten about this but stil golfing! No problem, and thanks, Morag. Will check emails on the morrow. 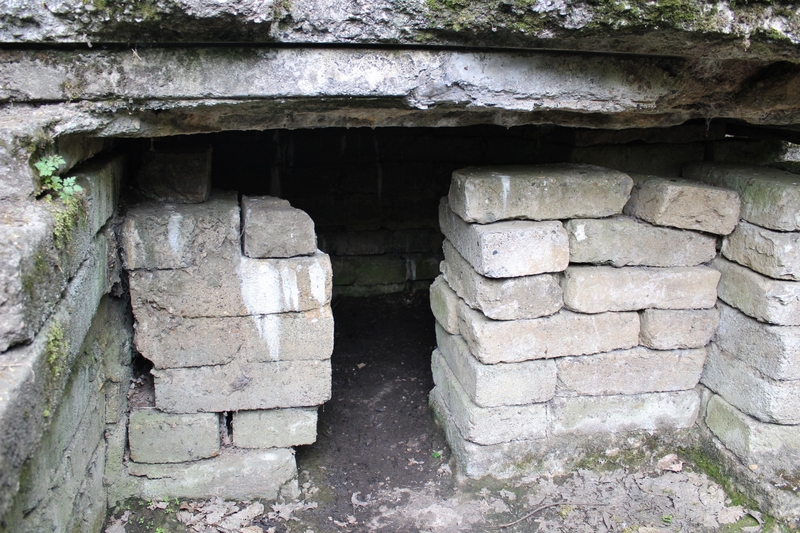 Another great article Magicfingers, the mining being of particular interest to me. 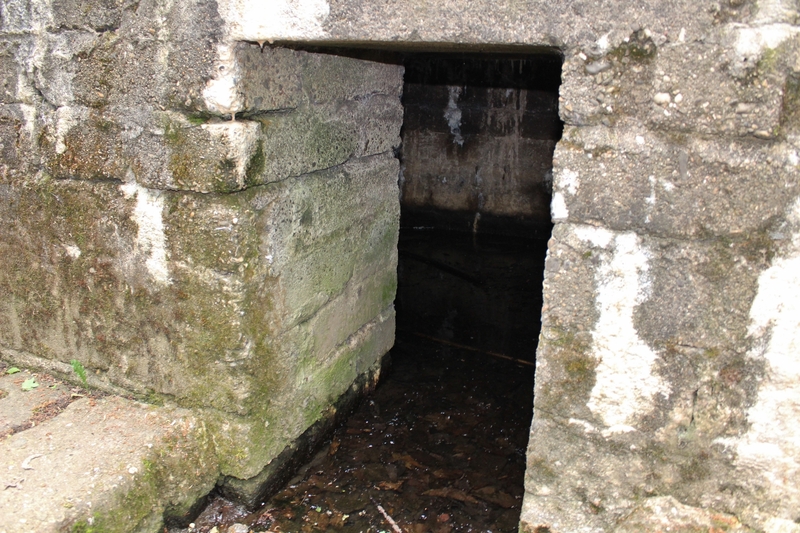 looks like the tunnels have got a bit ‘damp’ over the years. You were only a few miles from Barry’s at that point, my apologies for not having sent you his details sooner. I’ll drop you an email. I’m glad you liked this one Nick. 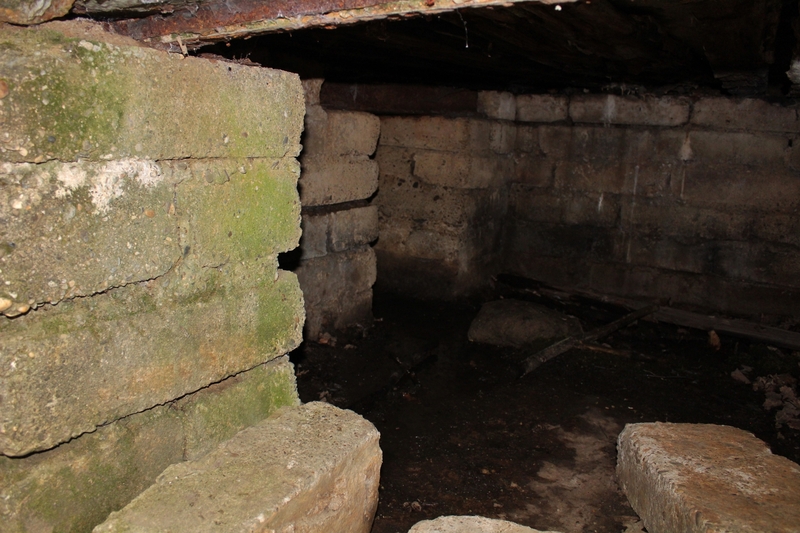 I’d have been down those tunnels like a shot given the chance! 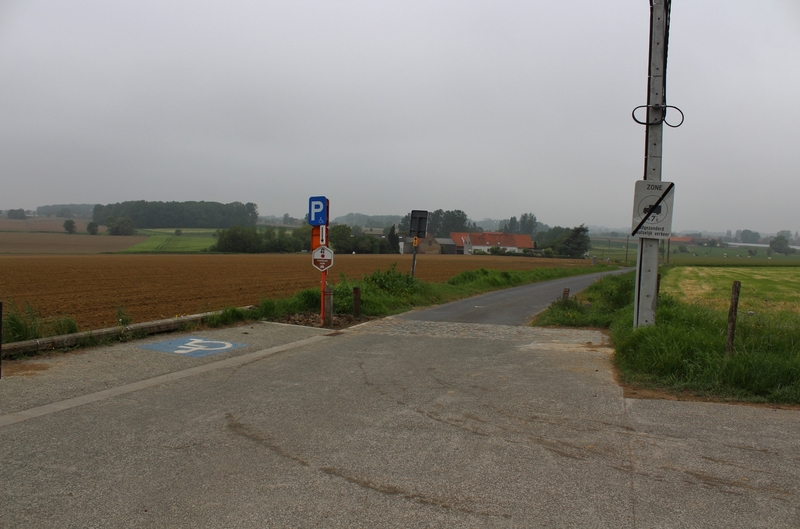 No hurry on Kemmel, but thanks anyway! Thanks for the article, as usual. 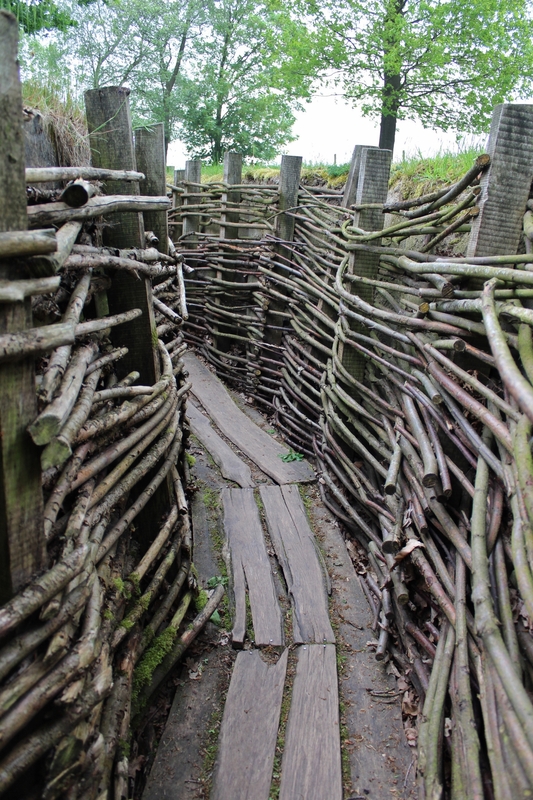 Lots of great detail – I’ll be using a fair slice of that when I’m there next weekend with a school group. 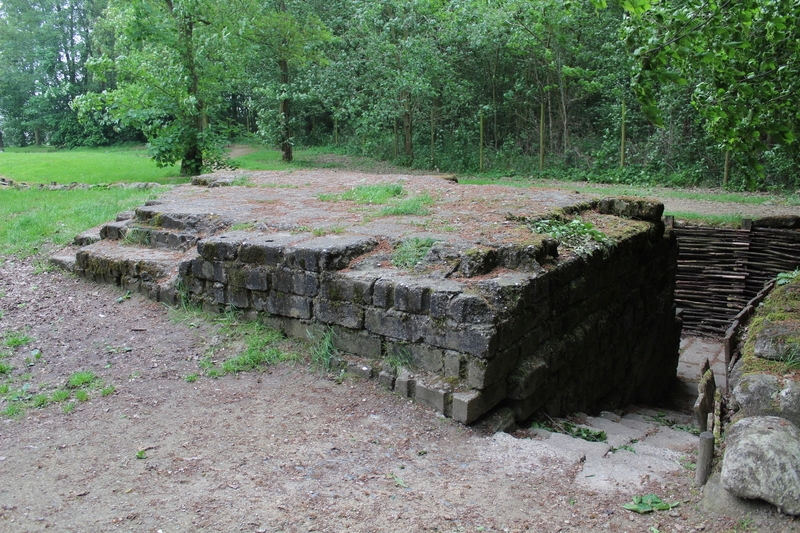 I recall going to Croonart Wood with my uncle and father in the late 70’s. We had travelled across in a camper van and, one night, parked up in a lay-by opposite a house. In the morning, there was a knock on the van door- we expected some sort of criticism for having parked there. Far from it, Andre had come down to ask us in for breakfast. So, we enjoyed egg and bacon, cooked on a griddle – very welcome. 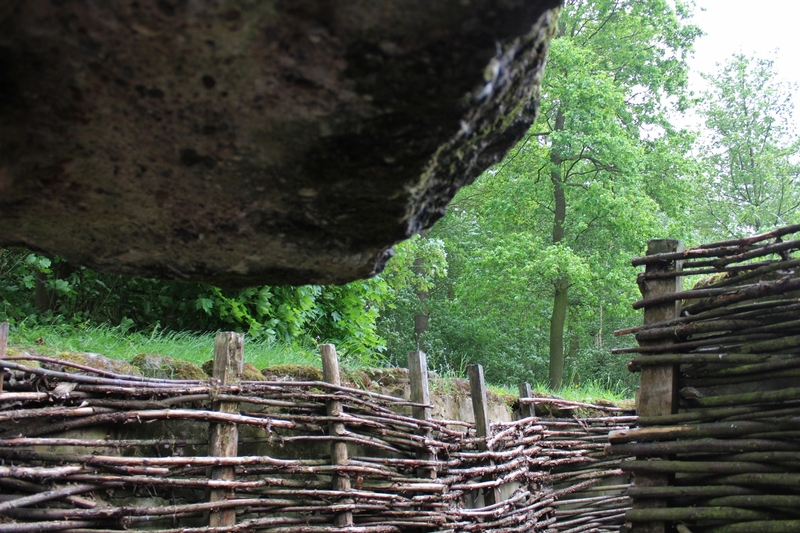 We had a great conversation with Andre about his battle with water in the shafts and about his efforts to establish a decent museum. He was a lovely bloke and it was a real shame when he passed away, not so long afterwards. So, once more, thanks for the excellent posts. Hello Alistair. Thanks for your kind words. And a wonderful Andre story – I’d like to think one might still get the offer of breakfast on occasions in this day and age. 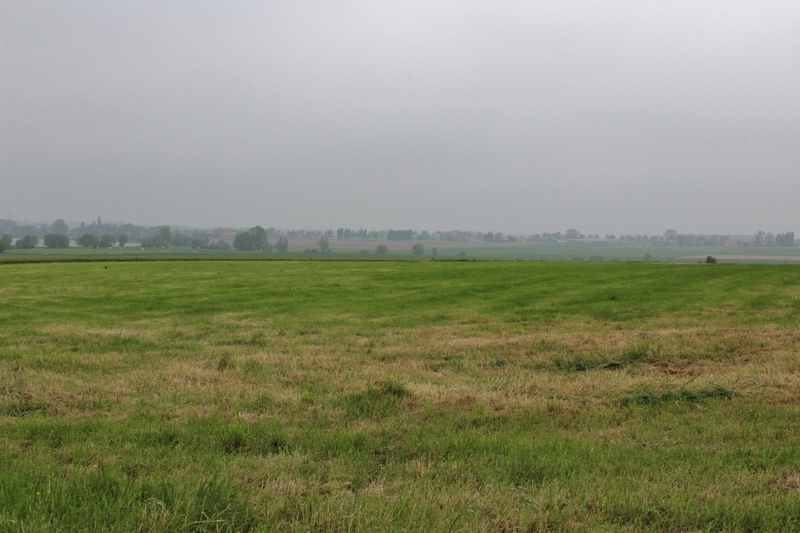 As we are currently, on this site, looking at the Battle of the Lys in French Flanders, here’s a little extra for your trip about the northern part (north of the Douve) of the Lys battle, the German attack on the Messines Ridge and beyond; if you stand at the board with the panorama photograph looking west at the view past Croonaert Chapel Cemetery – by the way there are memorials down the road at the start of the track to the cemetery, and a single unknown Chinese Labour Corps man buried just inside the entrance – you have a great view, on a good day, of this part of the battlefield of April 1918, which is seldom mentioned when one visits here. 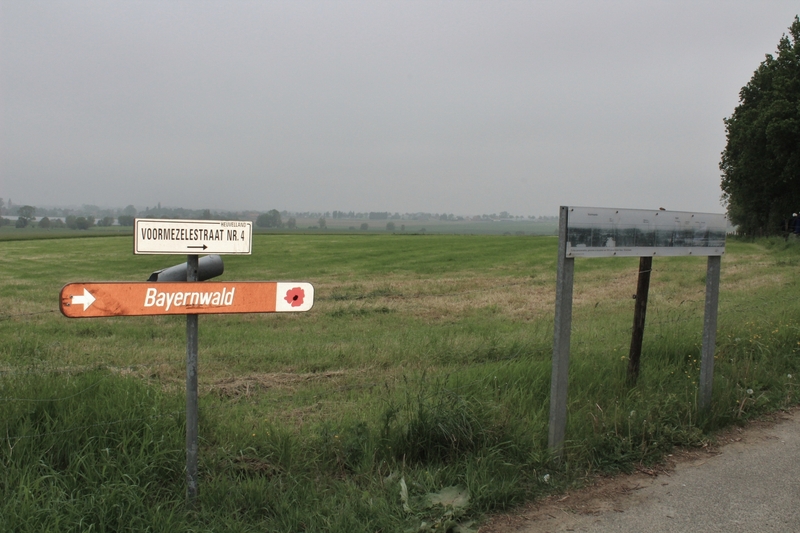 Wytschaete having fallen to the Germans on 16th April, the horizon reveals the Kemmelberg (captured on 25th April) and the Scherpenberg, which the Germans attempted to take on 29th April, failed, and thus ended the official Battle of the Lys. 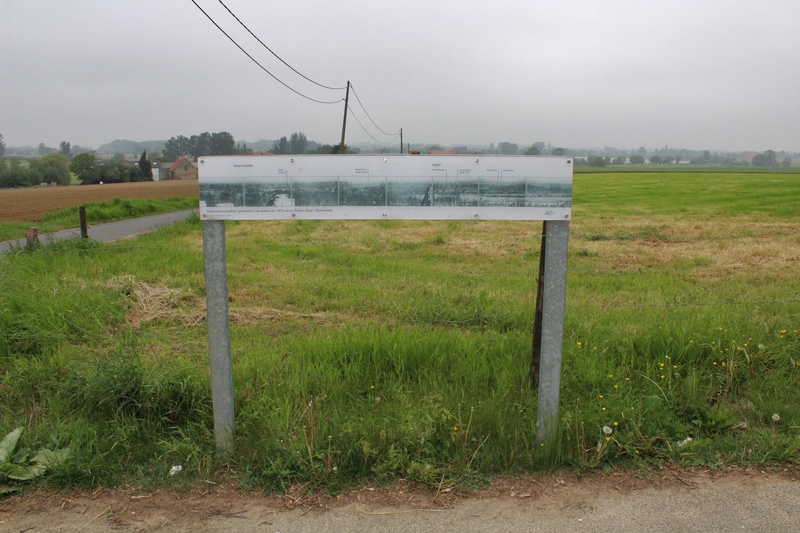 Both are marked on the panorama photo – Bailleul, eight miles to the south west, and also marked on the panorama, fell on 15th April. 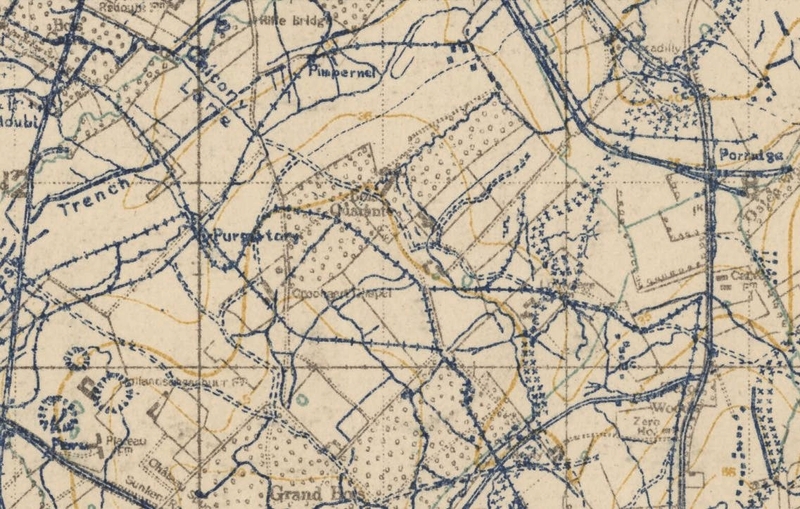 And then consider the fact that Bailleul fell the day before Wytschaete, and you get an idea of how the Germans were sweeping up north west from French Flanders as well as attacking more westerly here near the north of the battlefield. 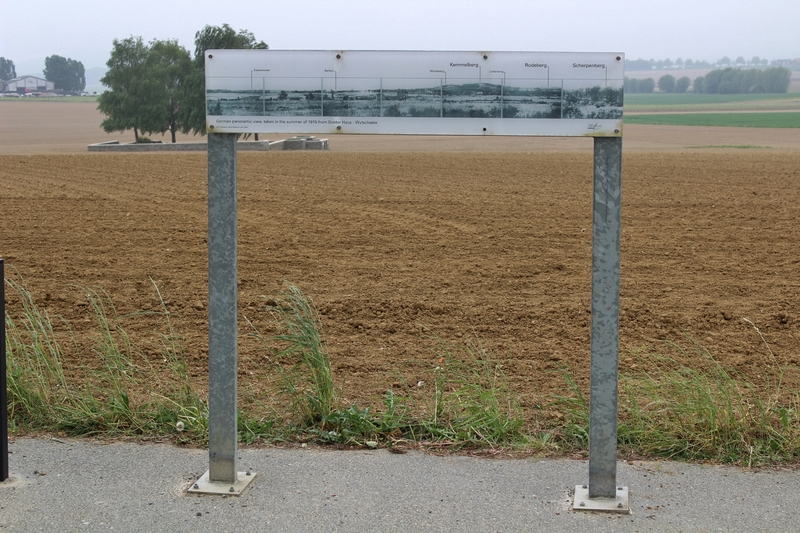 If they could have reached the rail junctions south west of Ieper and Poperinghe then Ieper would have been effectively cut off. Good job they didn’t. If any of that makes any sense. Anyway, have a fantastic trip, tell those kids all about these brave men, and it’s nice to know my site comes in handy for such things. Thank you. Alistair, if you have already read the above, my directional ‘easts’ have now become ‘wests’. No excuses, just idiocy. I do apologise for any confusion. Of course if you haven’t read it yet, then disregard this bit entirely! No problem. 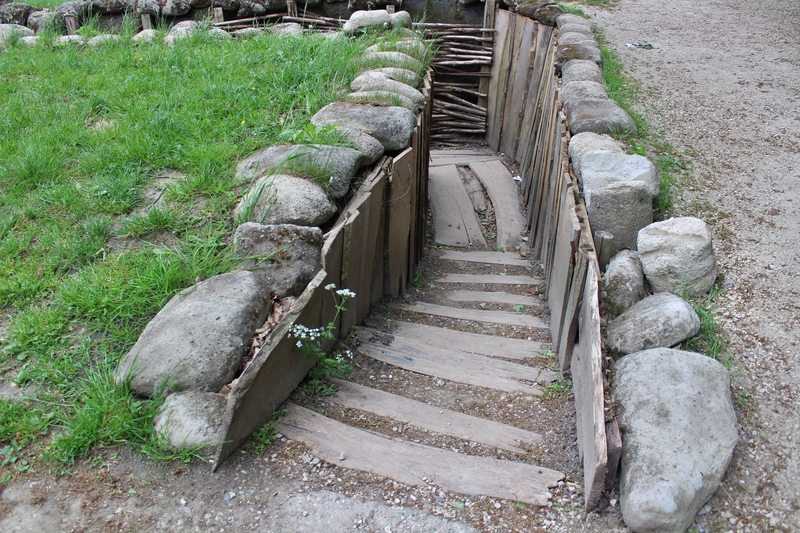 Off tonight and will be at the Menin Gate early tomorrow with bleary eyed group. 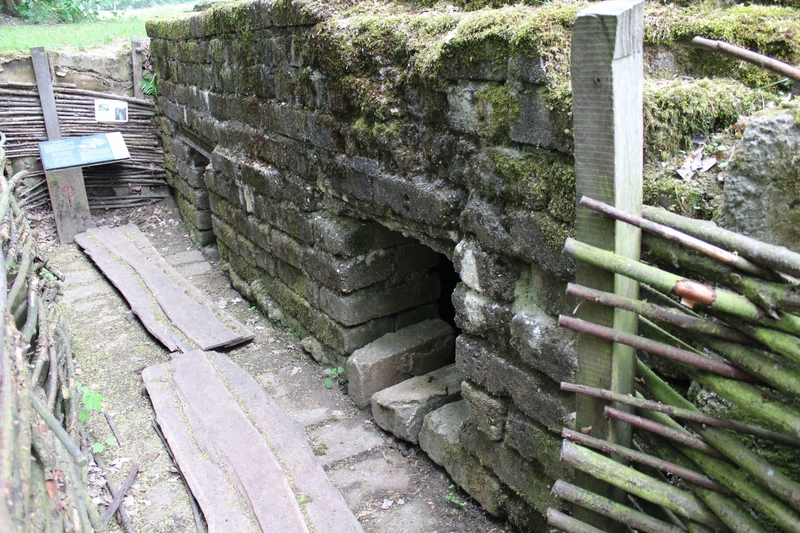 Reading up some great posts on the Gate including the piece on the 4 executed men whose names appear on the panels. 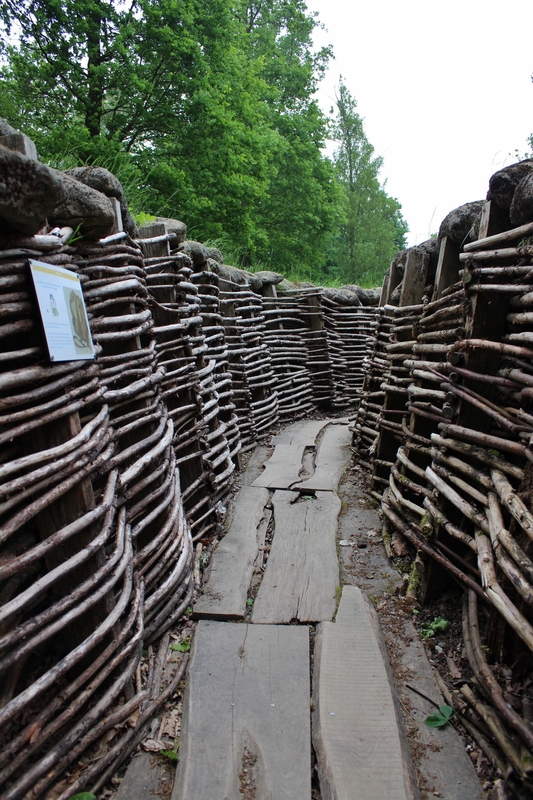 Will be busy reading other posts as we go down to the Somme on Saturday. Happy Days. Have a great time. 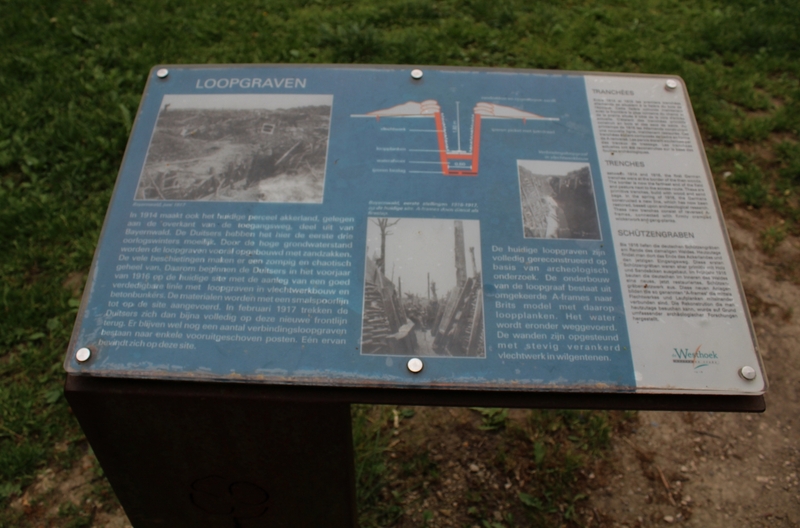 Good job I put the map up with the location of the four executed men on the Menin Gate! Took me a while to find them. Should make life easier though. 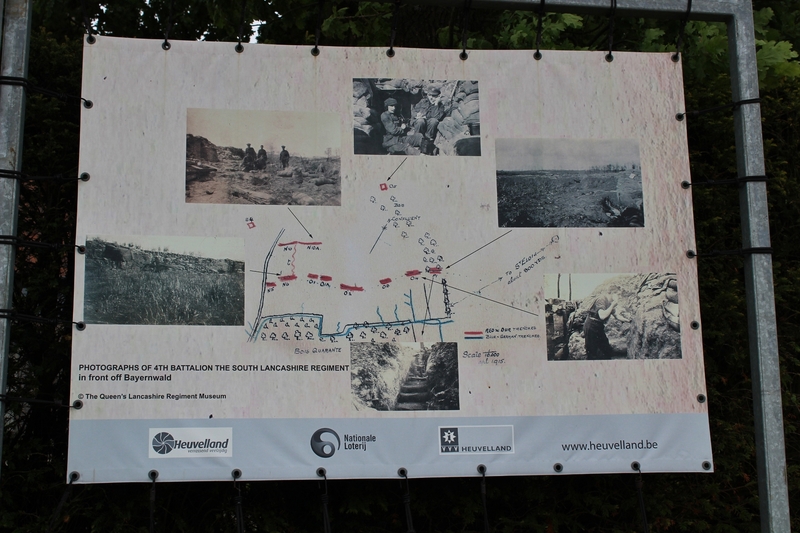 And there’s a Somme map in the Interactive Tour Maps bit with links to all the Somme posts, if that helps.